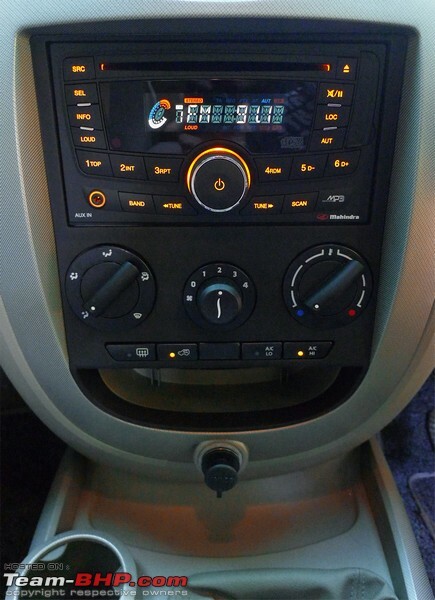 The Mahindra Quanto has been launched in India at a price of between Rs. 5.99 - 7.57 Lakhs (ex-Delhi). 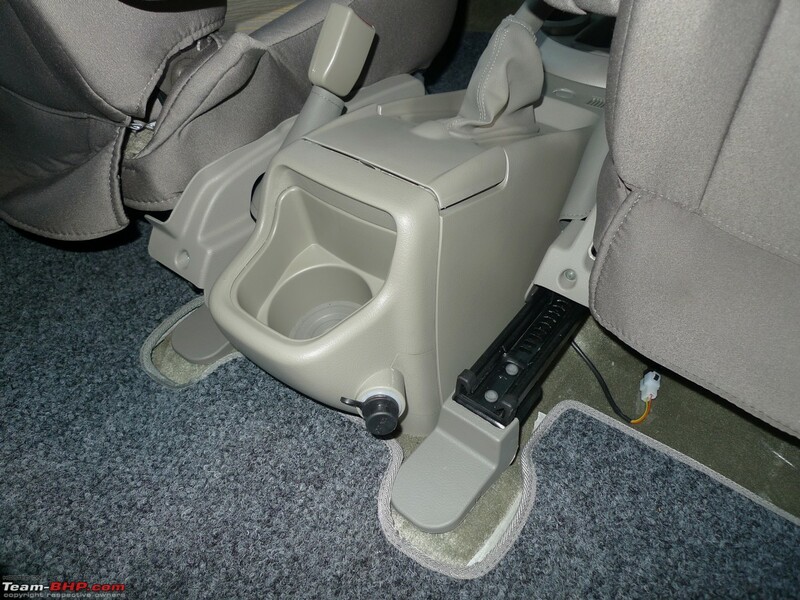 • Features include reverse parking aid, two front armrests, lumbar adjustment, door puddle lamps etc. Mahindra is to utility vehicles what Maruti is to hatchbacks. Indeed, the country's biggest UV maker does have all bases covered. The Bolero dominates the Rs. 6 - 8 people mover category, the Scorpio is the best selling SUV in India and the XUV500 has set record volumes for a 15 lakh rupee vehicle (whether sedan or SUV). Question is : when you already have a strong market position, where does the growth come from? One way is to enter market segments above your existing stronghold, the other below. 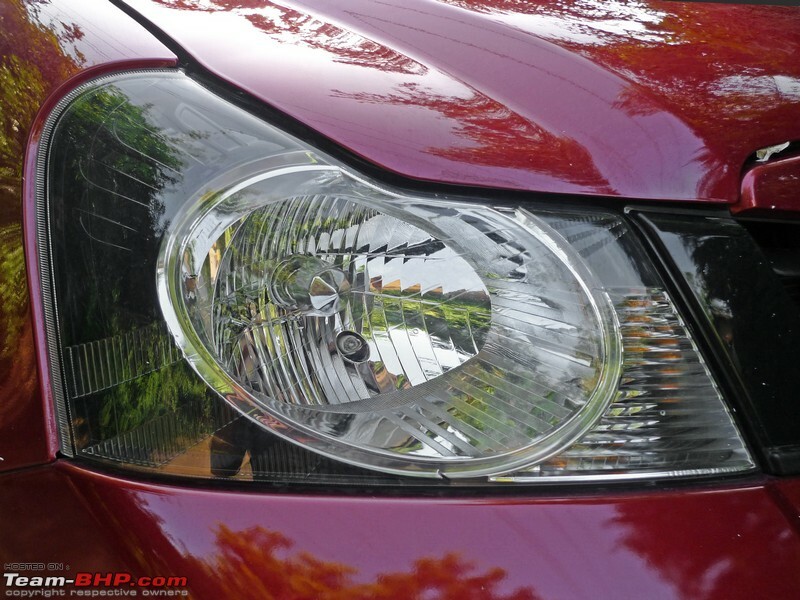 Mahindra certainly hit the bull's eye on the premium segment with the XUV500. Now, it's time to look at the budget class below. 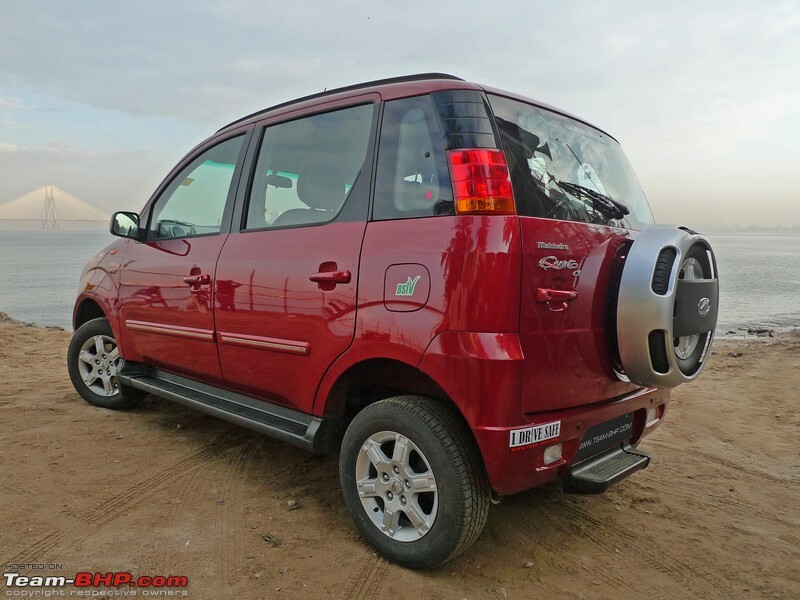 The Xylo has had a sub-par market run by Mahindra standards. Its average monthly tally of 2,200 units (for the last 12 months) is way below the volume that the Bolero, Scorpio and XUV500 bring home. While I consider the Xylo's overall package as superior to that of the more expensive Scorpio, the design & image have worked against it. What better way to capitalise on the Xylo's platform than to create a cheaper derivative, and one that's positioned differently. 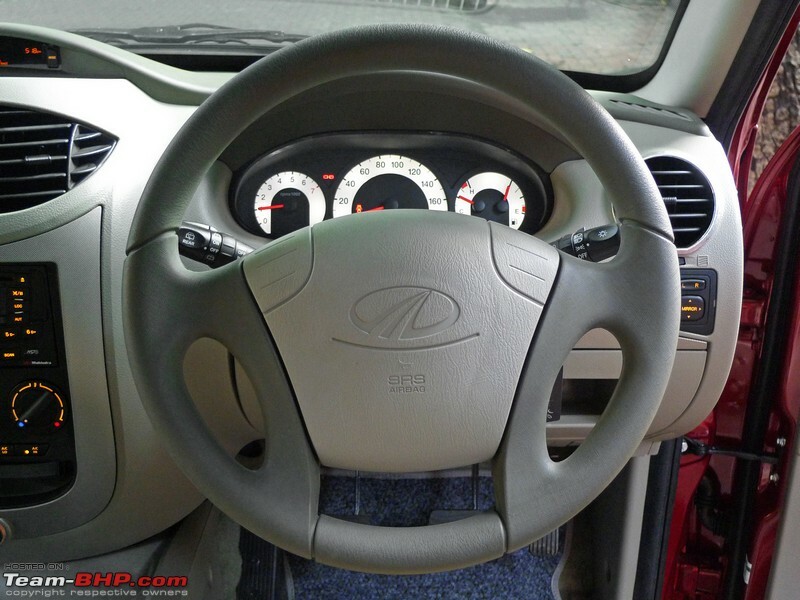 That Mahindra was working on a sub-4 meter version of the Xylo is the industry's worst kept secret. 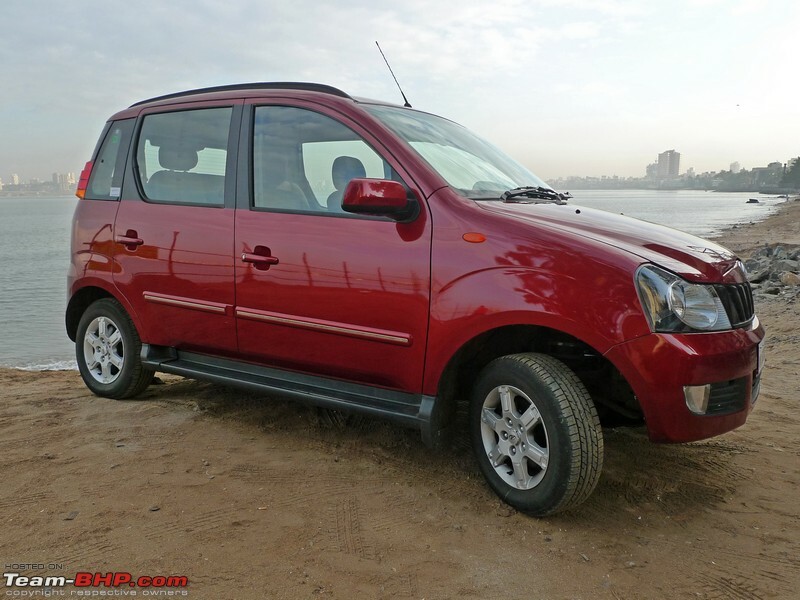 The Quanto is perhaps the most scooped vehicle in Indian car history (we broke the name here). 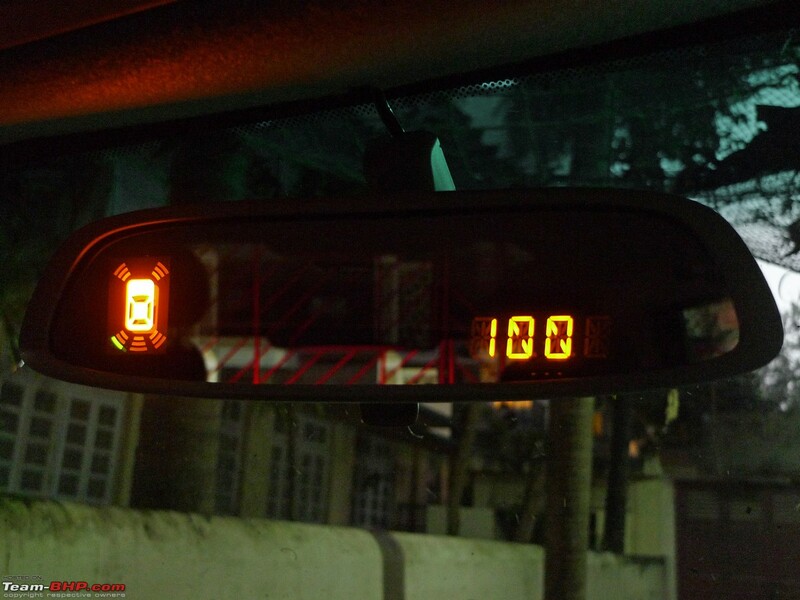 The reason behind the Quanto's existence is simple : The applicable excise duty on short sub-4 meter cars is only 12%. The same for the full-size Xylo is 27%! The Quanto is the 2nd sub-4 meter SUV in India. The Premier Rio was the first, but it's maker's reputation & market presence are too insignificant for the product to have made any impact. The Quanto project cost Mahindra a mere 100 crores; that's chump change for a new product & market position. As the Quanto & Xylo share the same parts bin, there is a considerable amount of cost saving there as well. 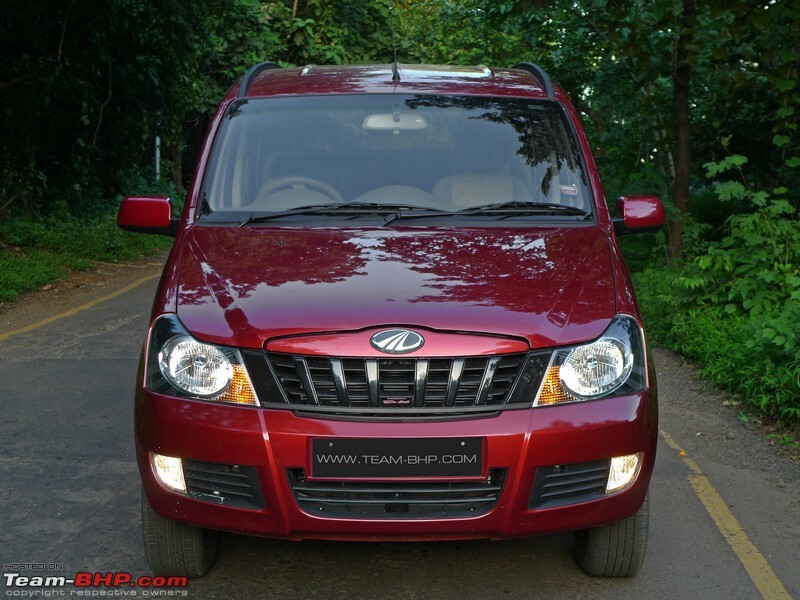 Mahindra has kept the Quanto's sales expectations at a conservative level of 2,000 units a month. Add the Xylo & Quanto numbers up and you are looking at a 4,000 tally from the same car & platform. While the current production capacity for the two is a combined 120 units per day, this can be ramped up to 280 units. In addition to private owners, there is no doubt that the Quanto will also appeal to the parallel commercial segment : cabs, police force, hotels and the like. It will also inevitably attract folk from Tier II & Tier III towns where rough road ability is a need rather than luxury. 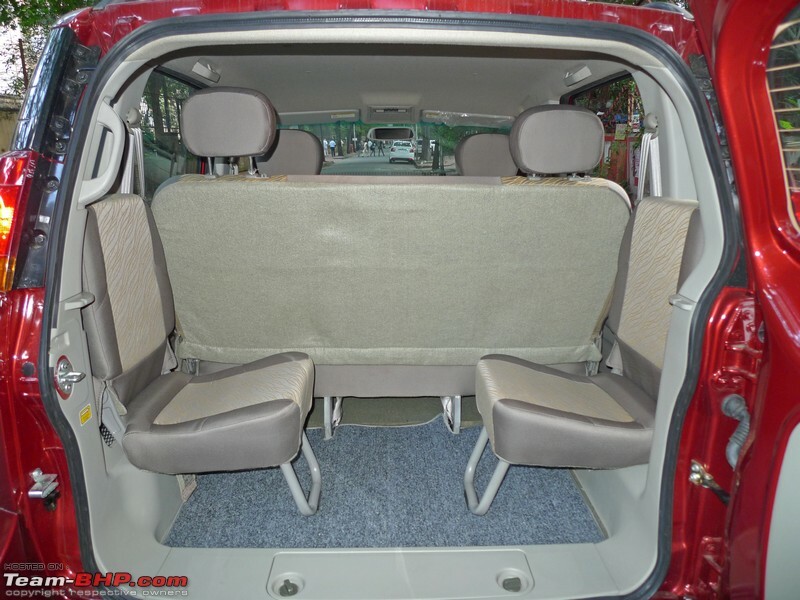 Question is : With so many sub-10 lakh UVs in a Mahindra showroom, is there possibility of product overlap? Of course yes and I don't think Mahindra minds it either. As Andrew Grove (ex-CEO of Intel) famously said : Cannibalise your own business; if you don’t, someone else will do it for you. Unlike what the pictures might suggest, the Quanto is not a small vehicle. It does have street presence. No surprise there as the height (nearly), width and wheelbase are identical to that of the Xylo. When viewed from the side though, the chopped rear is too obvious and will take a lot of getting used to. No, the Quanto isn't going to win any beauty contests too soon. The Xylo is quite the ugly duckling and the chopped Quanto only carries that unfortunate styling forward. The front is nearly identical to the Xylo's face, save for miscellaneous changes here & there. Keeping in mind that Mahindra is targeting hatchback owners, they could have worked on the design and toned down the angry face. 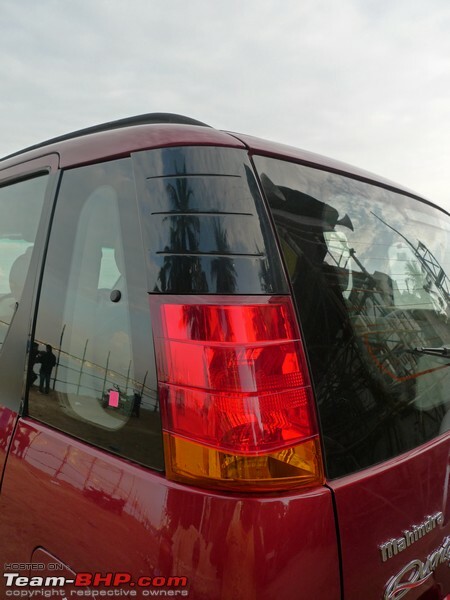 The rear is better looking than the Xylo's, but that's really not saying too much. 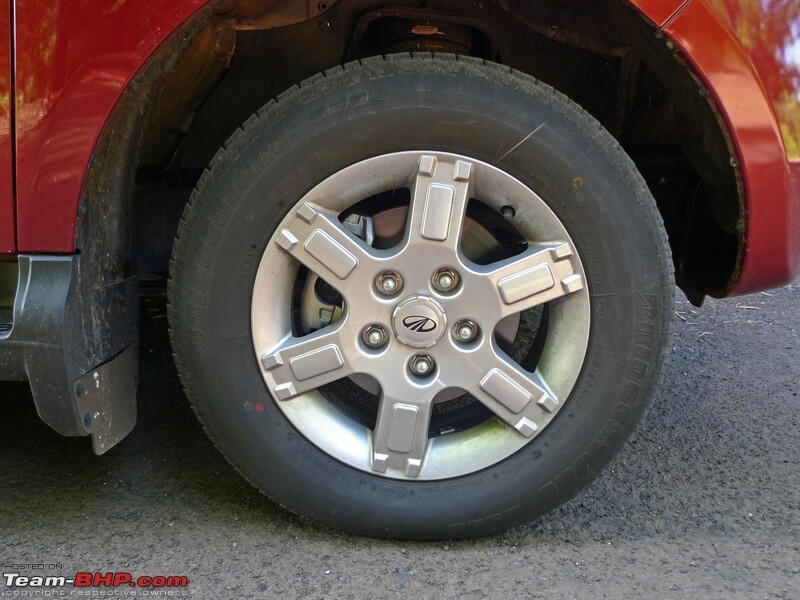 The main reason is the SUV-ish placement of the spare wheel. 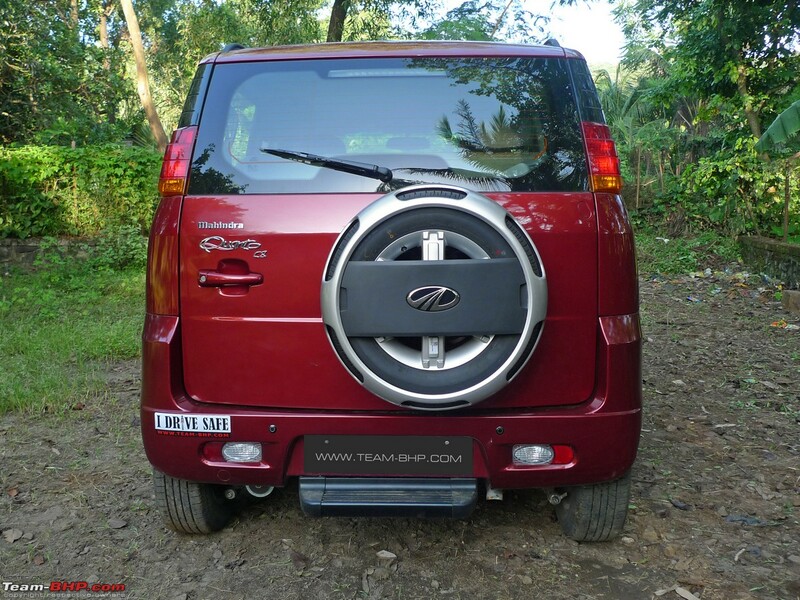 That spare wheel alone has given the Quanto an SUV look (instead of an MUV). 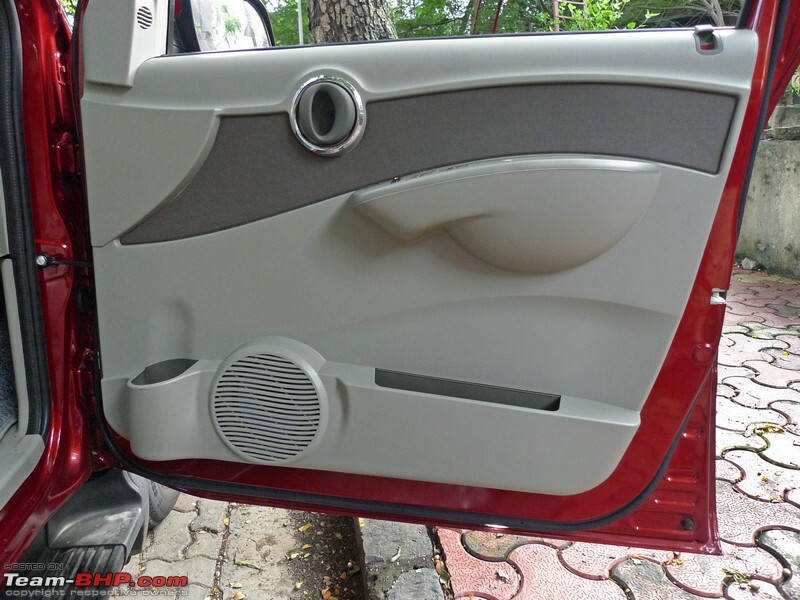 Mahindra fit the spare at the back for looks, yes, but packaging is the primary reason. The spare wouldn't have fit under the shortened chassis. The unusually tall height of the Xylo & Quanto lends them weird proportions. I simply don't understand why the vehicle has to stand this tall; headroom is anyway excessive on the inside. The Quanto would have looked a lot better if it was shorter. A lower stance would have helped road manners as well. 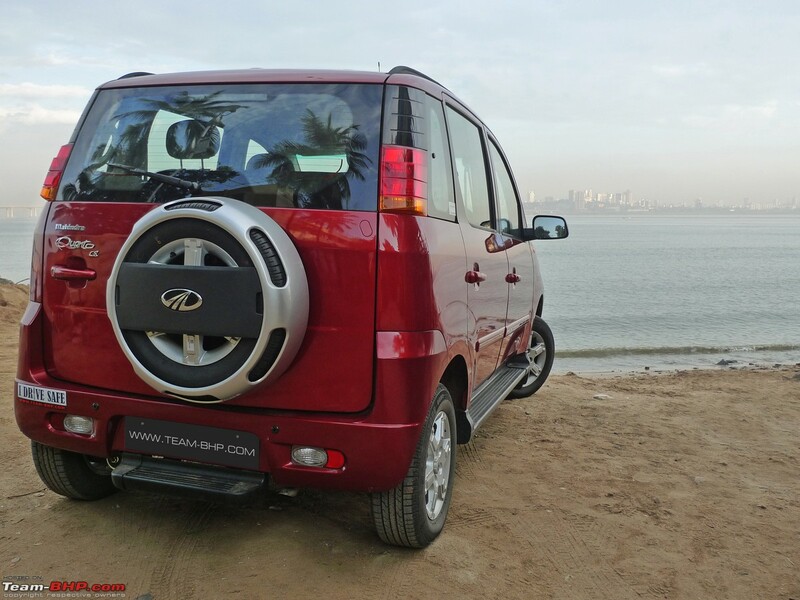 In terms of exterior build and quality, the Quanto feels like a modern Mahindra. 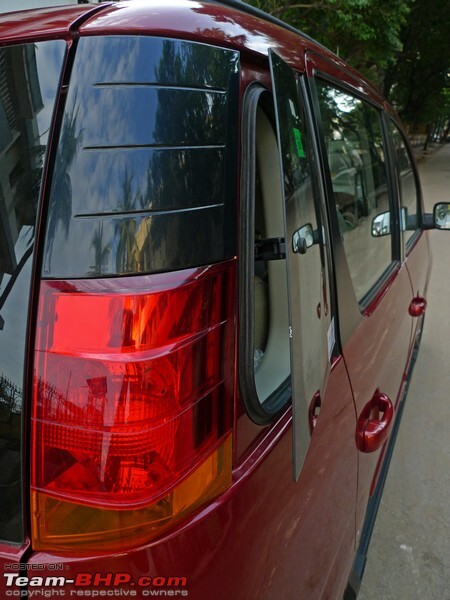 Fit & finish are at acceptable levels, nowhere as crude as the Bolero, and you won't have any major complaints. The SUV feels robust and built to handle abuse. 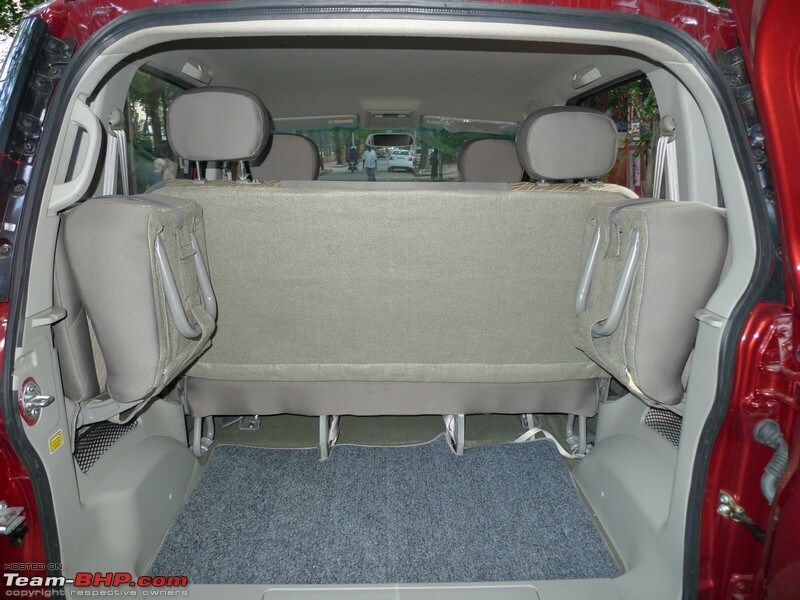 There isn't a doubt that body-on-frame UVs are more rugged and also better suited to load carrying (the Ertiga & Duster are both monocoques). 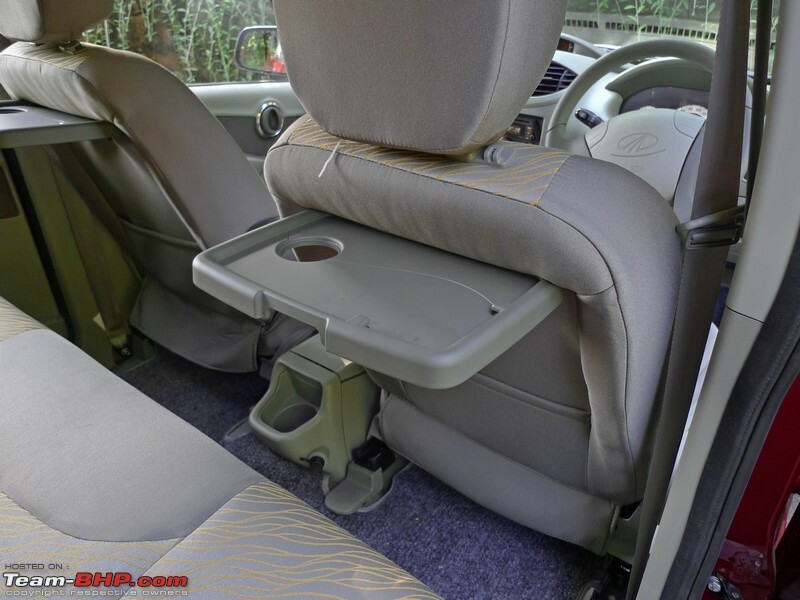 Mahindra knows that a part of its customer base will inevitably overload the Quanto. Get this, the tyre pressure sticker even has a "7 or more" entry. Having a 3rd seat row is a tremendous marketing advantage. 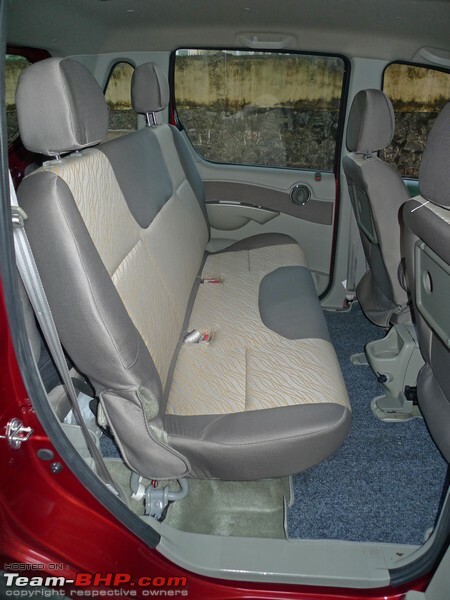 It also means that you have to comply with lower emission norms, as the rules for 5-seater vehicles are more stringent. 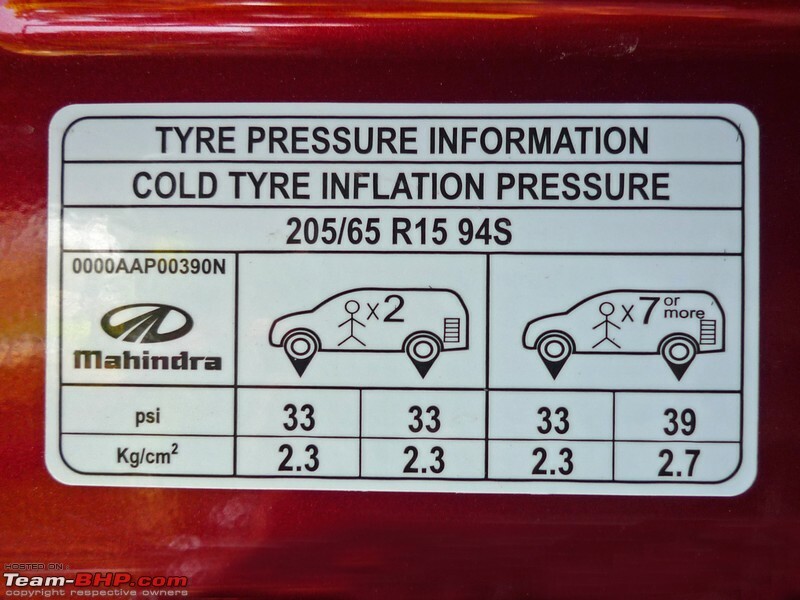 A problem area with most Mahindra and Tata vehicles is their weight. Weight is an enemy of performance, efficiency & dynamics. The two simply don't know how to cut the flab. The Quanto base variant weighs a whopping 1,640 kilos! That's 500 kg of extra metal over the Renault Duster and 400 more than the Maruti Ertiga. It's about as much as the Toyota Innova, a substantially larger people mover. 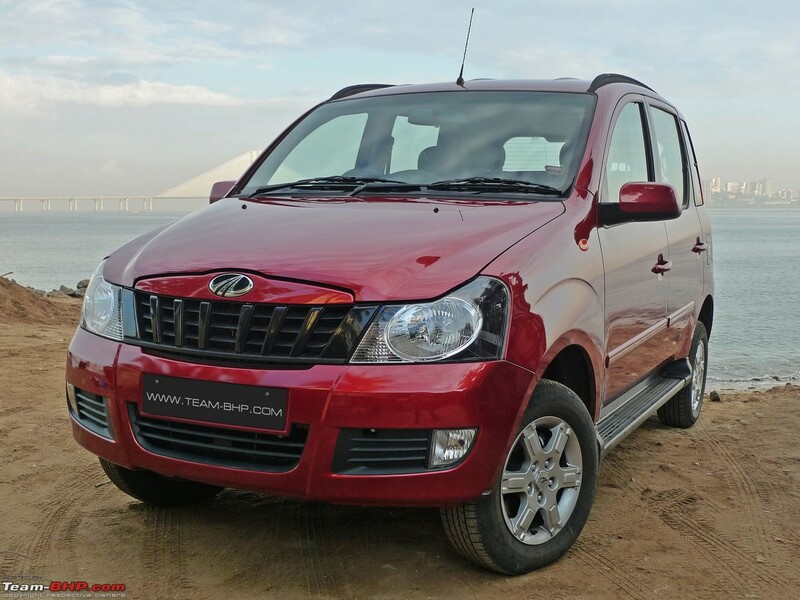 The proposed Quanto 4x4 variant with a 2.5L diesel engine will probably add another 150 kilos to the tally. This might just be the heaviest sub-4 meter vehicle in the world. Mahindra expects a lot of sedan & hatchback owners to cross-shop with the Quanto. I don’t agree with that. The Quanto is a good utility vehicle for those on a budget, but it's no hatchback slayer. 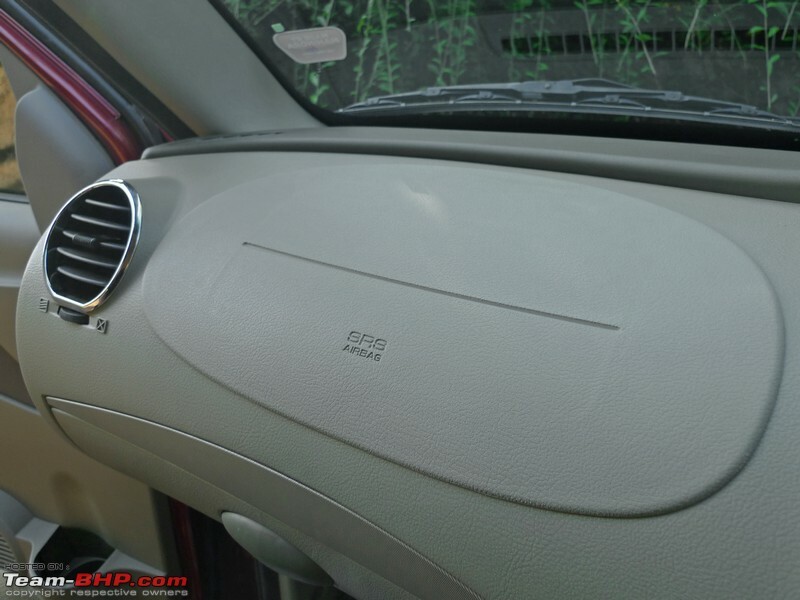 Cars like the i20 & Dzire are so much more polished. Their quality & refinement levels are in a different league altogether. While the competing sedans & hatchbacks are light & easy to drive, the Quanto drives like any other Mahindra does. 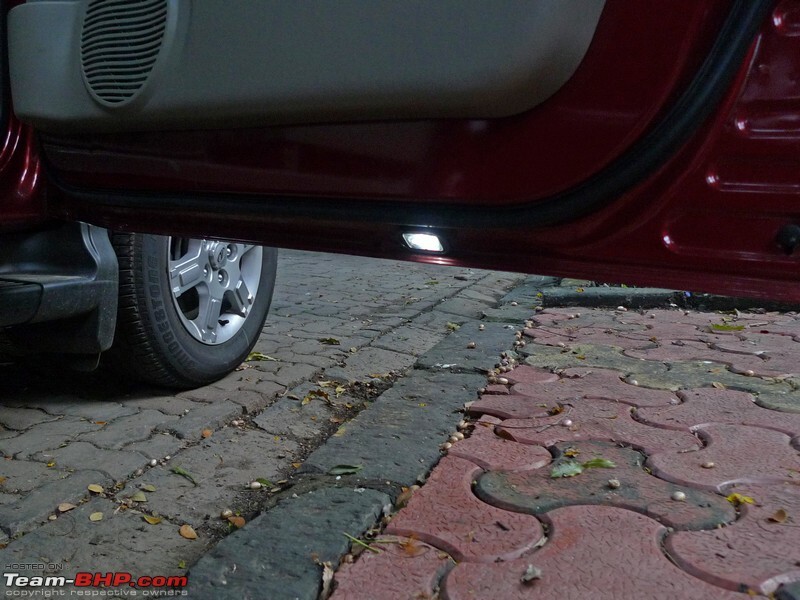 When Mahindra launched the Xylo, their ads predicted the end of C2 segment sedans. That didn't happen, did it? On the positive side, there are advantages with driving this kind of a vehicle. Broken roads don't pose any problems, rickshaws & tempos don't cut you off, you have a superb view of the road ahead and it's easy to make your way through traffic. Then, the 3rd row of seats can prove useful in a family function when you just have to carry 6 passengers. Shorter black grille looks better than the huge body-coloured unit of the original Xylo. 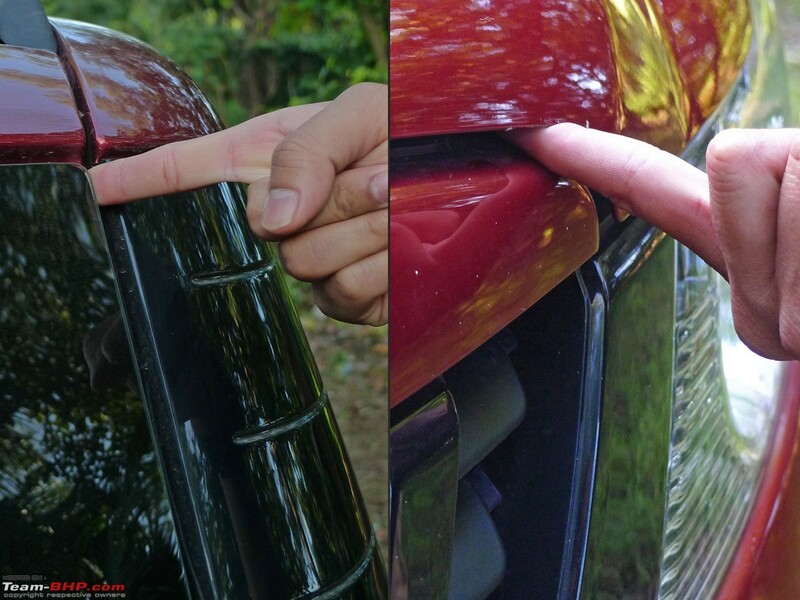 Crude gap between the grille and bumper. You won’t see an intercooler below. Reason? It’s mounted on top of the engine! Last edited by GTO : 8th October 2012 at 09:59. You don't step into the Quanto as much as you climb into it. The floor & seats are on the higher side. While the younger folk will not face any issues, the elderly will need those running boards to get in. The rear seat is placed even higher than the front; senior citizens might ask for assistance when getting out (as my Mom did). The Quanto's doors close with a clunk, rather than a nice thud. If you've been in a Xylo, you'll be right at home with the Quanto. Interior design, quality and space are identical. 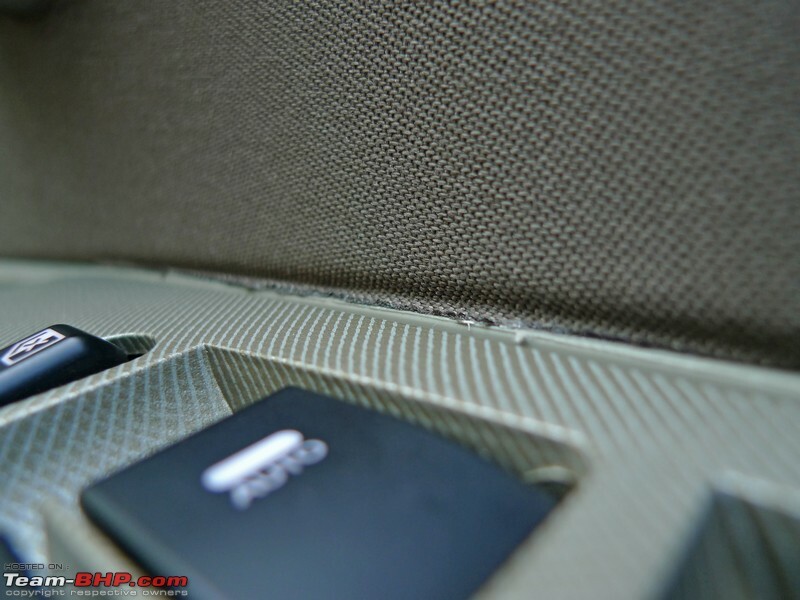 Thankfully, the Xylo's cheap wood finish has been removed from the Quanto. The chosen interior colour is fairly neutral and will keep a majority of its owners happy. 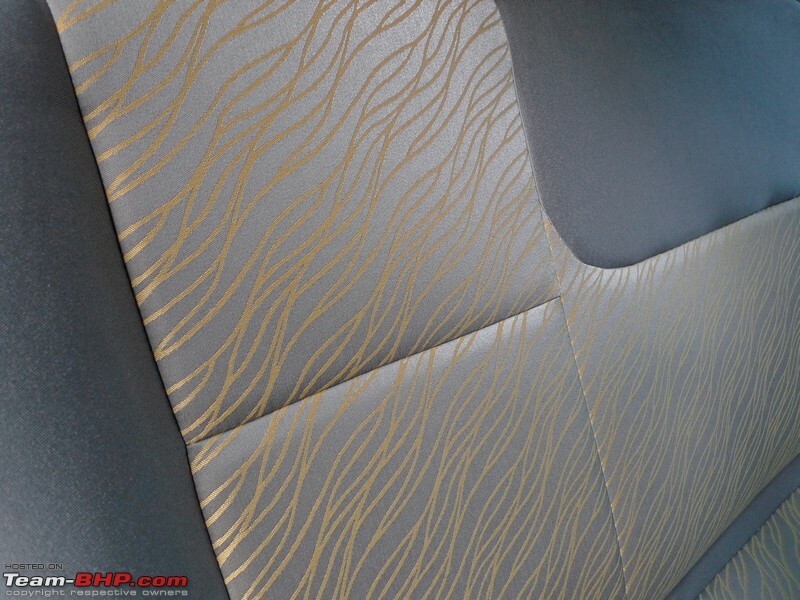 I found the seat's yellow upholstery to be very gawdy though. 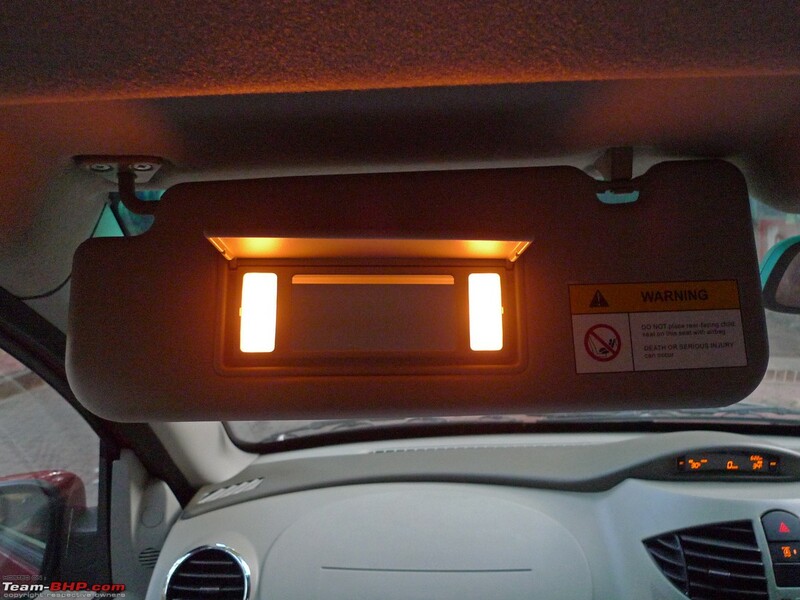 The interior shades aren't too light and thus, won't be difficult to keep clean. Interior quality is basic, yet liveable for the most part. Part quality is a notch above the Xylo of 2008. I found the interiors to be just about acceptable at this price point. Although if you look closely, you'll find some rough edges, ill-fitted parts and uneven panel gaps. 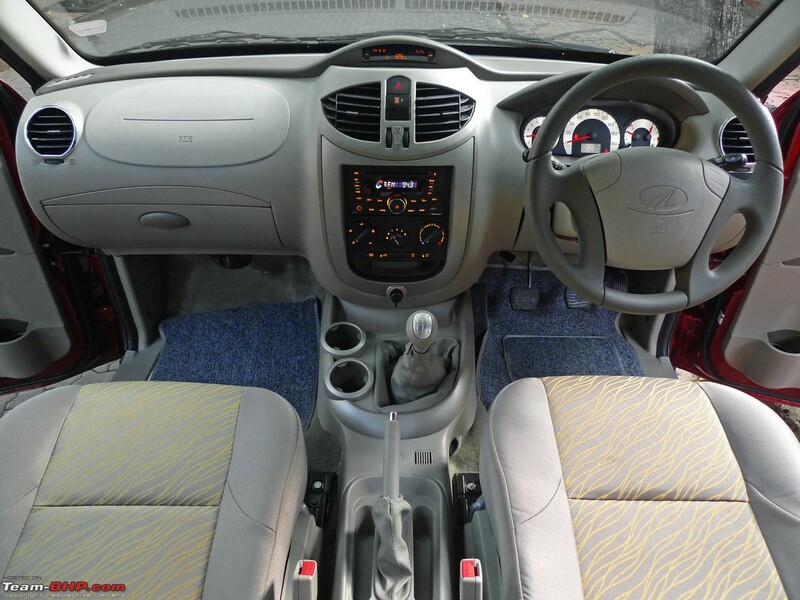 Don't even think of comparing the interior quality to that of the Dzire or i20. Mahindra has learned a lot over the years and is 80% there. It's the final 20% that is the most uphill, it seems. As a result of the enormous greenhouse, the cabin is immensely bright and airy. The glass area is simply massive! 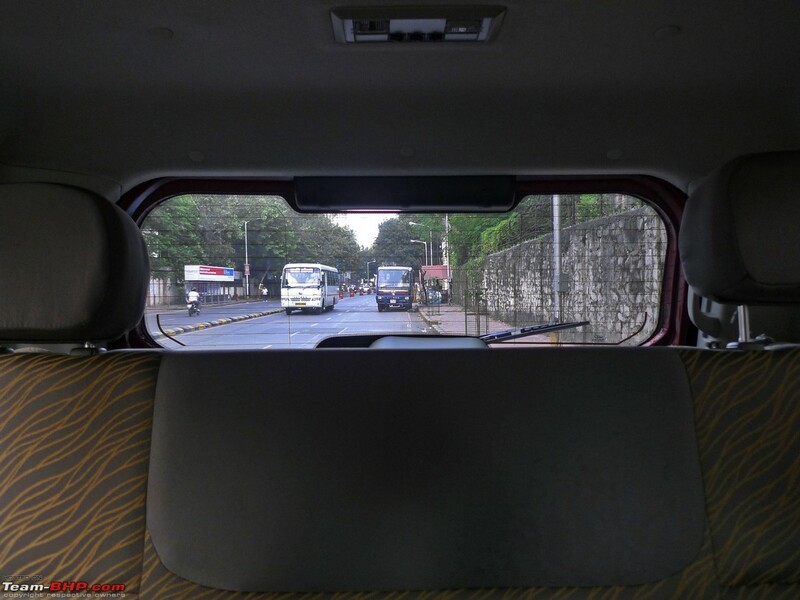 The tall driving position gives you a fantastic view of the action ahead. Yes, it does feel like a proper SUV from behind the wheel. This driving position should win the Quanto a lot of fans. Lateral view is excellent due to the window area starting low. On the other hand, because the rear seat is placed so high, if there is a vehicle parked at your tail, you won't see it. 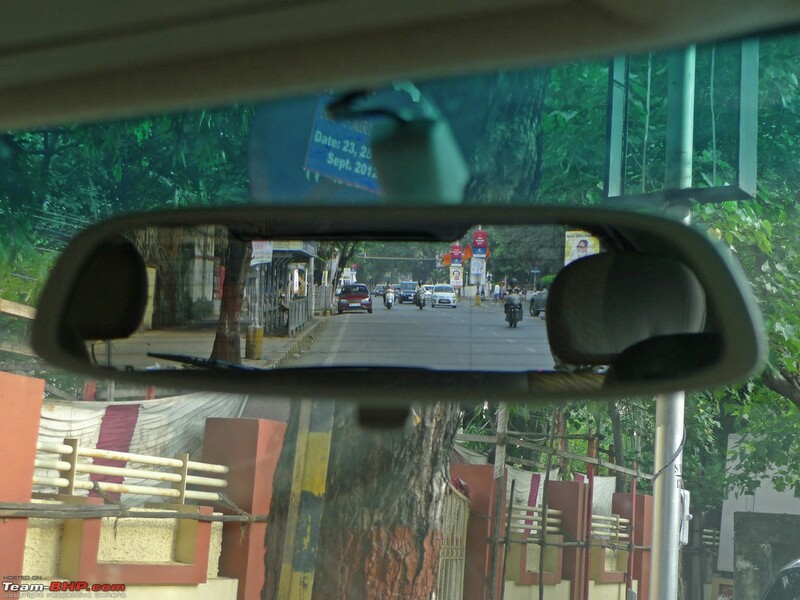 I completely missed a Maruti A-Star behind me. Please exercise caution when reversing. 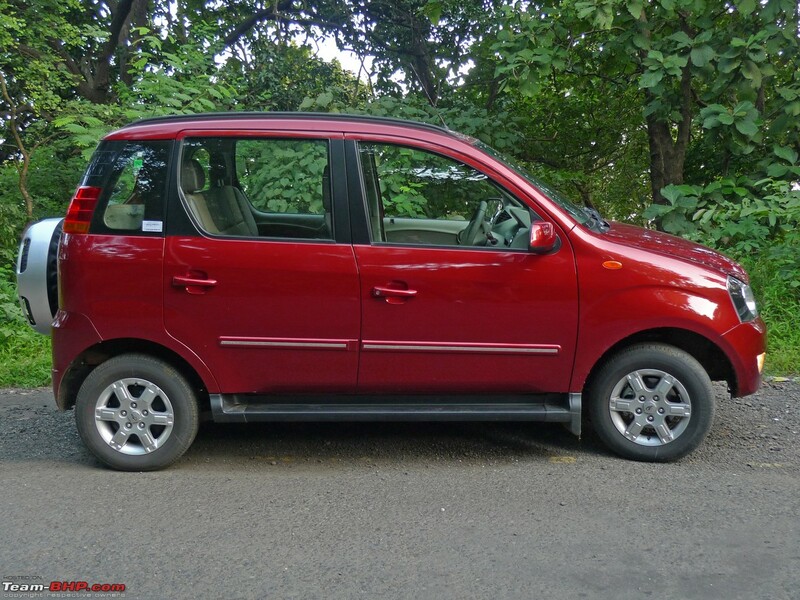 Though the Quanto has been shortened, the wheelbase is identical to that of the Xylo. 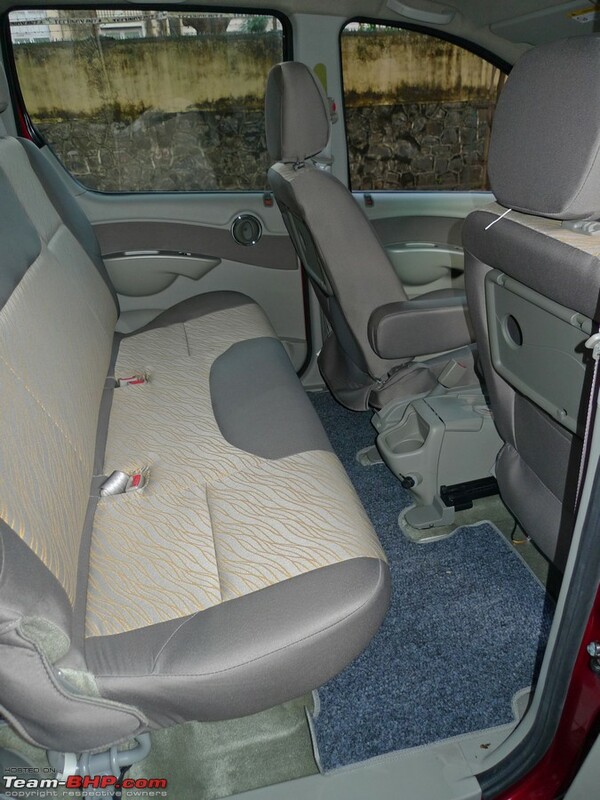 The driver & co-passenger area have abundant space. The front is "big car" like and is easily comparable to D2 segment sedans like the Civic & Corolla. The width is equally impressive. Even with two well-fed personalities in the front seats, there was ample clearance between them (no elbowing your co-passenger in the Quanto). The seats are large and accommodating of the heavily built. Overall seat support is run-of-the-mill and nothing to write home about. The seat fabric is on the firmer side and feels like it'll be hard wearing. The seat height adjustment has two levels to offer; all the way up or down. To make it stop in the middle is tricky. It's not a well-designed function and the easiest way to adjust it is to get off to bring it up and, conversely, sit on the seat to take it down. The difference between the two positions is quite a lot and shorter drivers will be satisfied with the driving position. 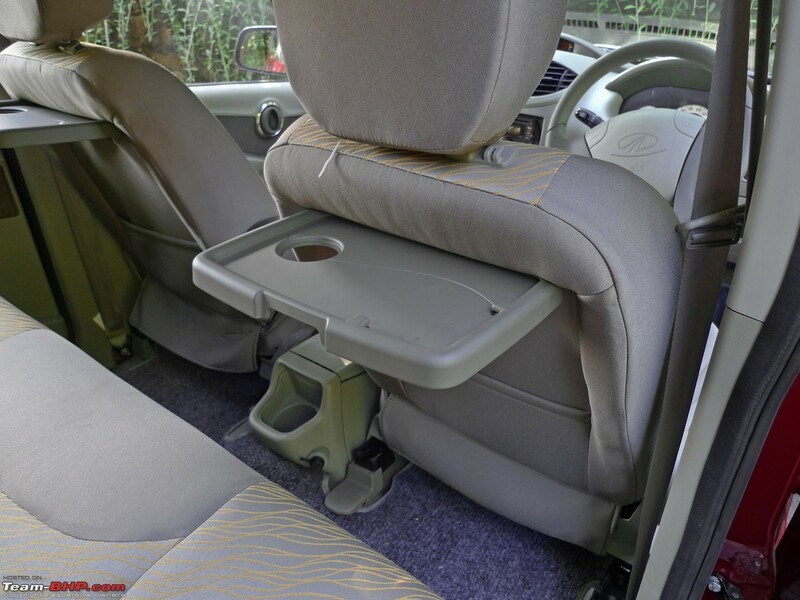 The Quanto offers 3 stage lumbar support for both front seats. It has excellent support and most people will stick to level 2 (as I did). One thing I really like about Mahindra UVs is their comfortable front armrests, one each for the driver & co-passenger. 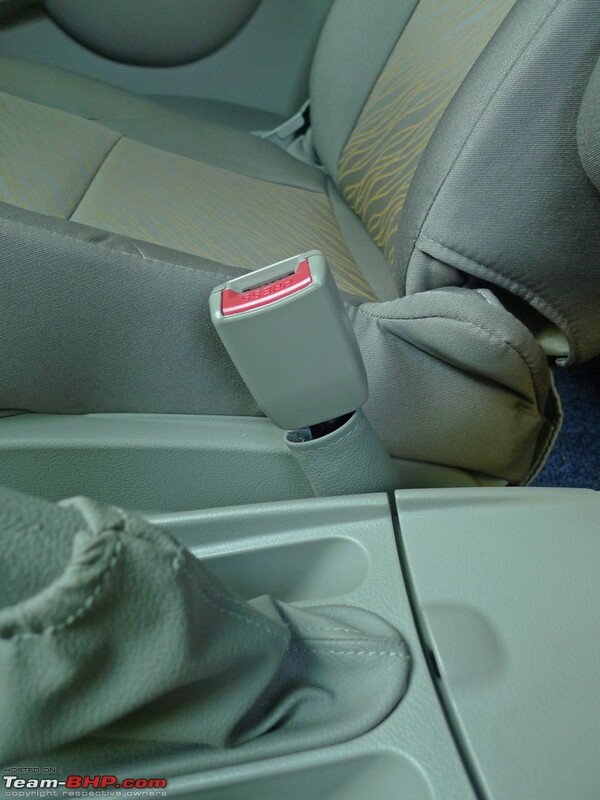 Due to these armrests, sitting on the front seat is akin to being on your favourite chair. 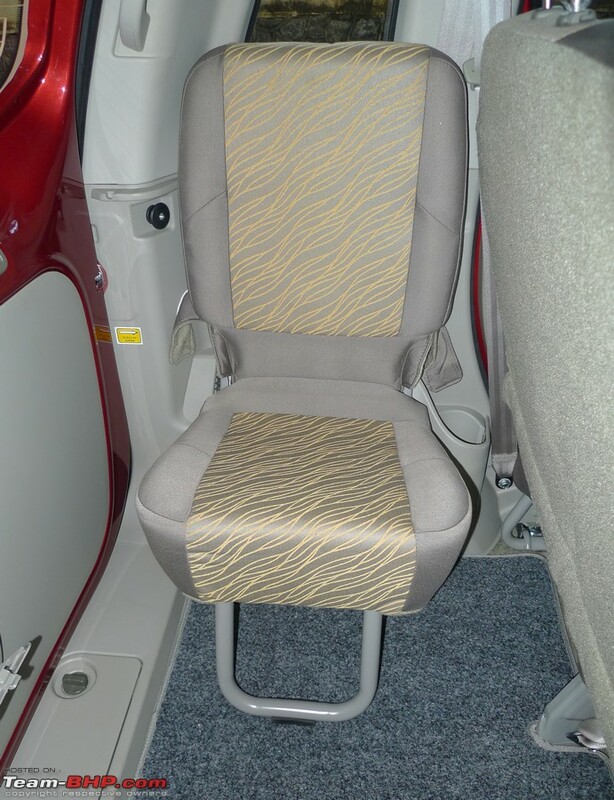 I must add that the armrests do come in the way of buckling & unbuckling the seatbelts. You'll have to fold the armrests up before doing so. Most ergonomics are fine, but a few are out of place. Due to the variety of adjustments on offer, I was able to find a comfortable driving position for myself. The steering falls right into your hands and there's no problem with the placement of the ABC pedals and critical buttons / switches either. 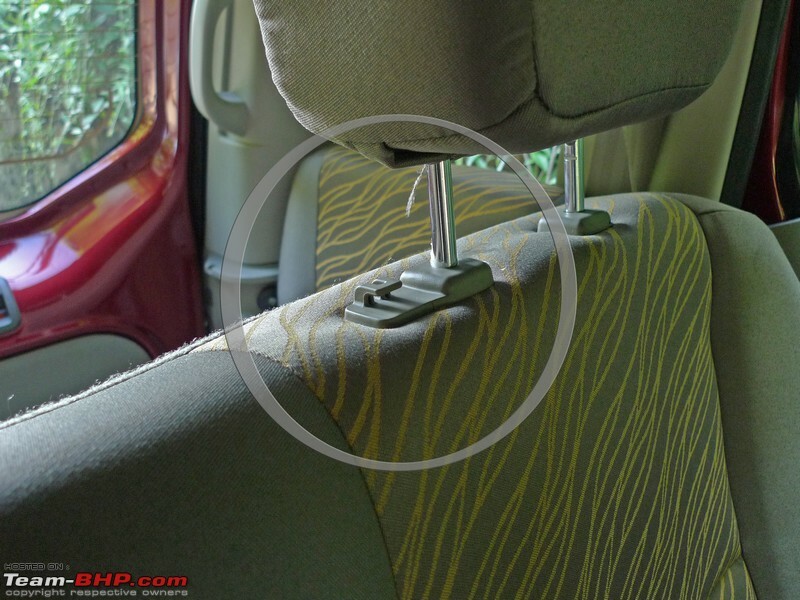 However, the steering tilt adjustment starts too high and doesn't fall low enough. At the topmost level, it's how a truck's steering is positioned. The gear lever is awkwardly placed too far down. It rests in 1st & 3rd gear where other cars would be in neutral while the 2nd / 4th / Reverse slots are really low. Then, there are the power window switches which are too close to you. All occupants will have to sharply bend their arms to access them. 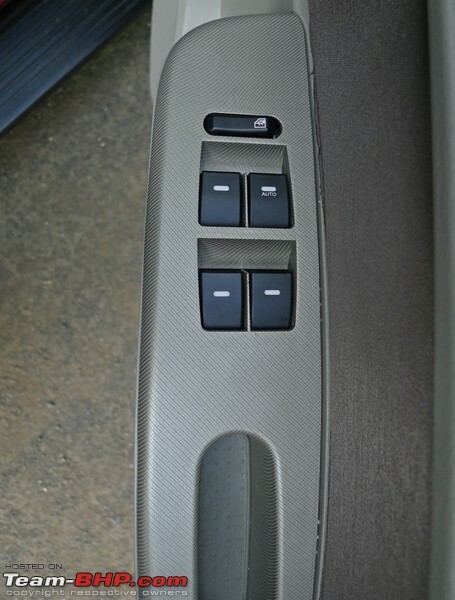 I've seen cars where the window controls are a stretch to access; this is the first where it's the opposite. 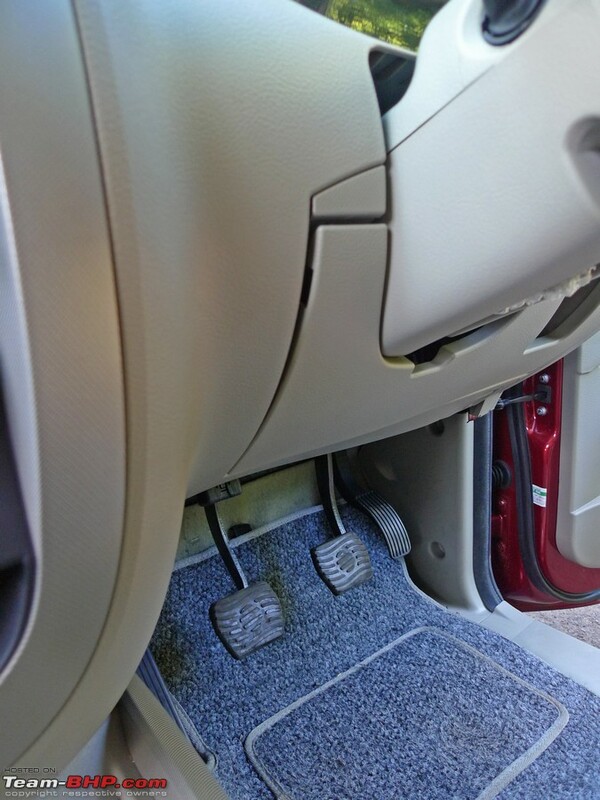 The dead pedal is thin and positioned too close to the driver. 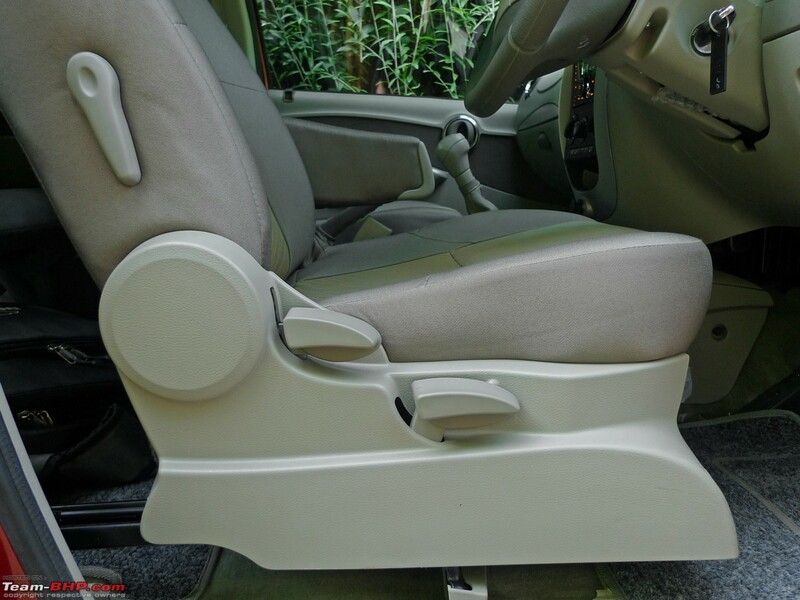 The rear seat is placed noticeably higher than the front. I'm 5'10" and could effortlessly look over the front seat at the road ahead. The huge rear windows start low and don't have any quarter glasses either; things are nice & bright in here. 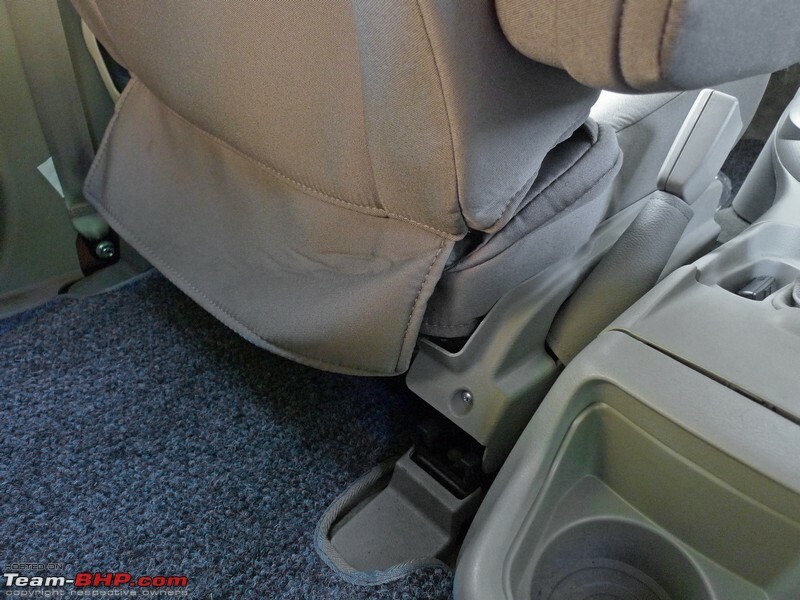 Middle row passengers have adequate legroom & headroom, while under-thigh support is satisfactory. The seat is really wide...wide enough to accommodate three without a fuss. We easily fit a family of 5 inside the Quanto. That's not something most 6 - 7 lakh cars can brag about. One complaint most passengers will have is that the bench is flat and that the backrest is too upright. This will negatively affect comfort over long journeys. The rear seat will suffice the needs of friends & family on recreational drives. However, it's not the place to be seated everyday. 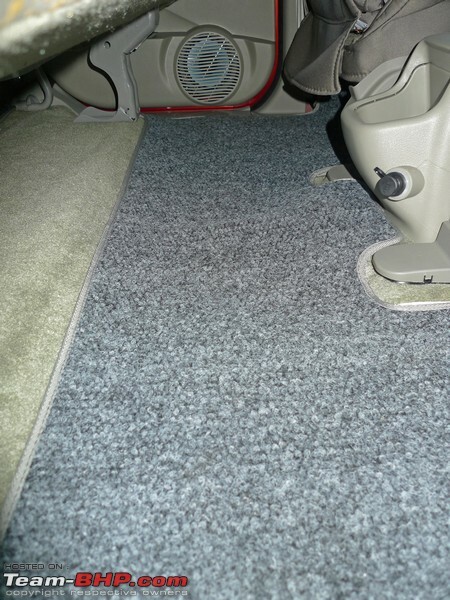 The flat floor lends enough foot room for all 3 middle-row passengers and the 5th occupant has a soft backrest, as there isn't any center armrest on this bench. The armrests located on the doors are much too slim. 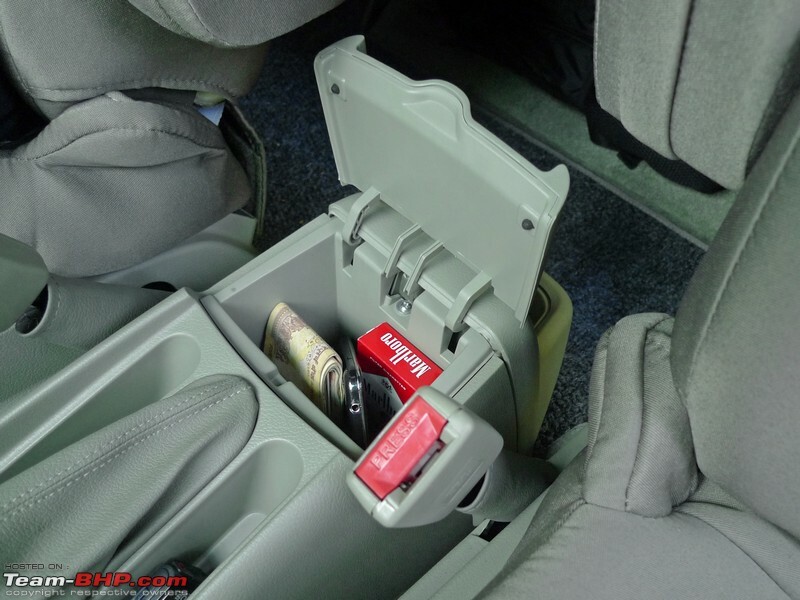 2nd row passengers get two food trays to hold the coffee & sandwich snacks. When folded away though, these rock-hard trays will hit against the knees of tall passengers. I preferred to keep them folded out, even when I didn't have anything to keep on them. You get more knee room this way too. The air-conditioner's performance is satisfactory. 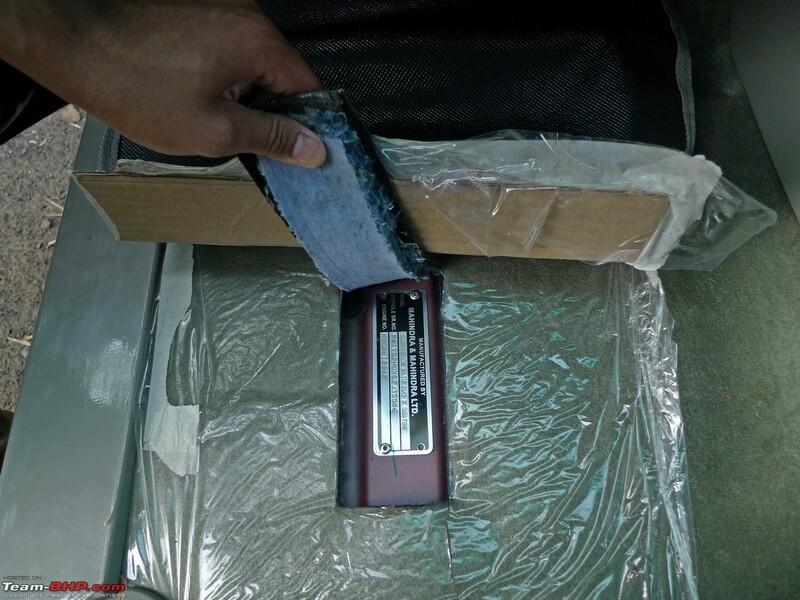 Even without sunfilm, the cabin was kept comfortable on a hot Mumbai day. 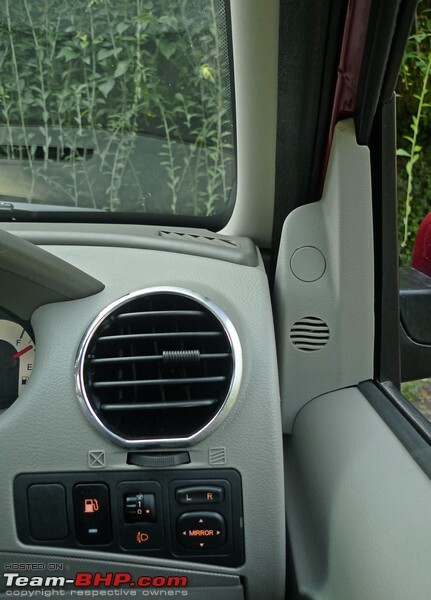 All 4 of the front air-vents have a powerful throw and the cooled air easily makes its way to the 2nd row occupants. Speed III (preferred with 5 onboard) isn't as loud as in some other cars. When I sat on the 3rd seat row however, I did need the blower speed to be cranked up to level IV. The Quanto's recirculation mode isn't tight. It frequently brought in foul smell from the outside. 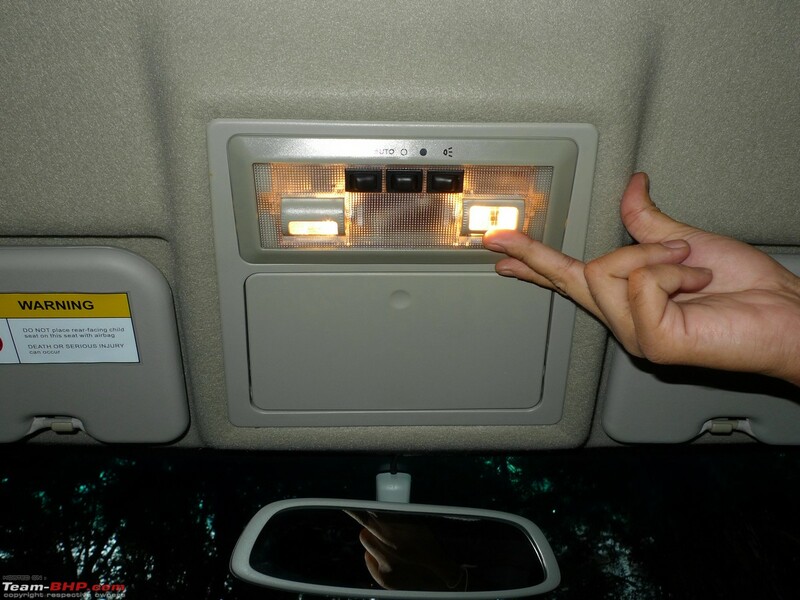 The Quanto gets a 2-DIN audio system with 4 speakers and 2 tweeters. 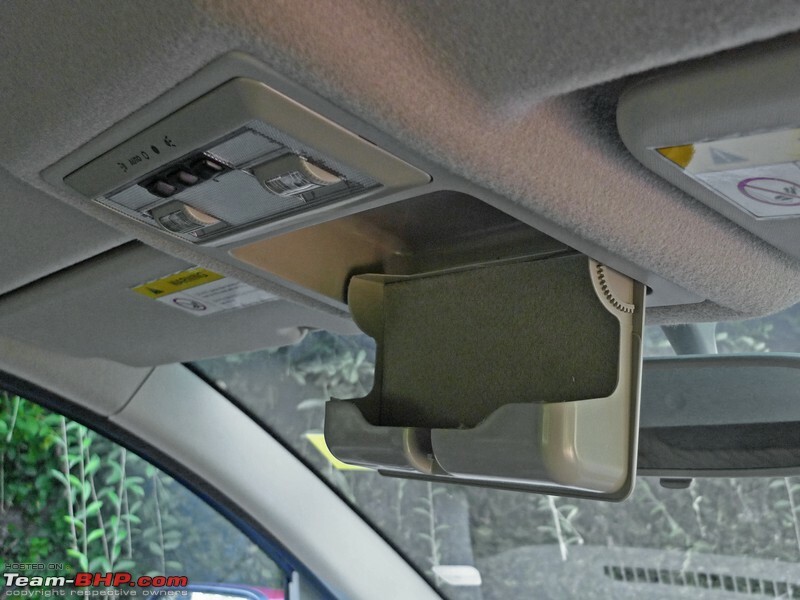 This Nippon head-unit is seen in some other Indian cars, including the Verito. It has inputs for USB, AUX and an SD card slot, but there is no bluetooth compatibility. 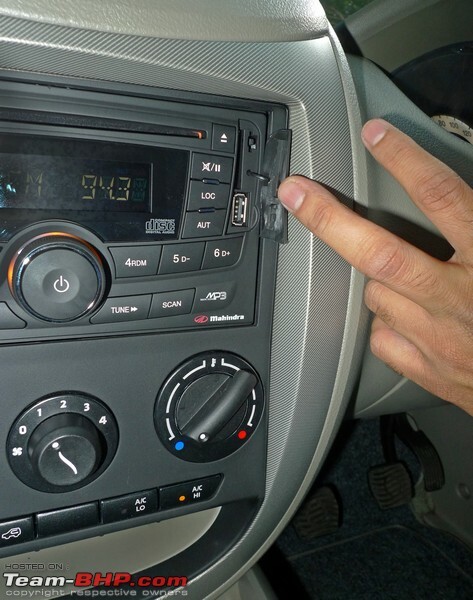 FM radio sounded mediocre, yet we were happy with the sound quality when playing MP3s off our USB flash drive. The illuminated glovebox has dedicated slots for a pen, business cards etc. It is wide but doesn't run deep enough. 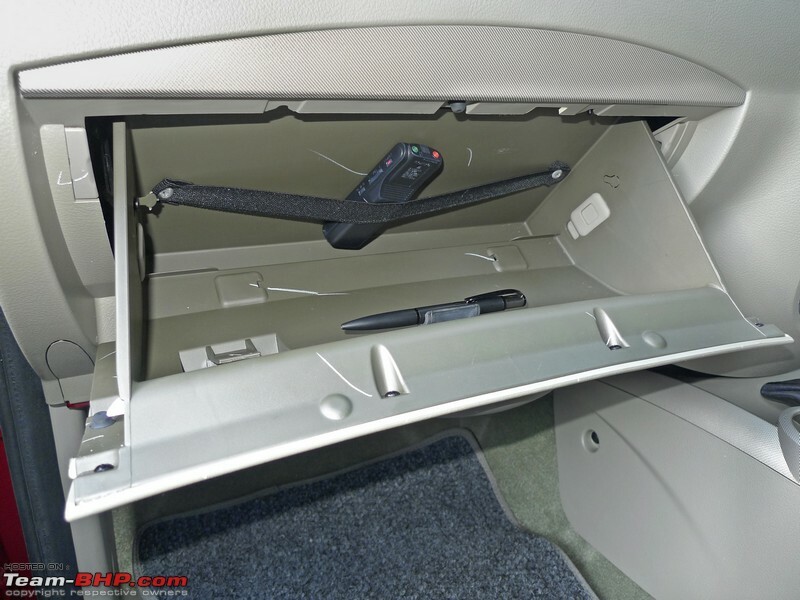 Below the driver's seat is a well-sized storage drawer that has a decent amount of space. However, it does require a strong hand to open & close. 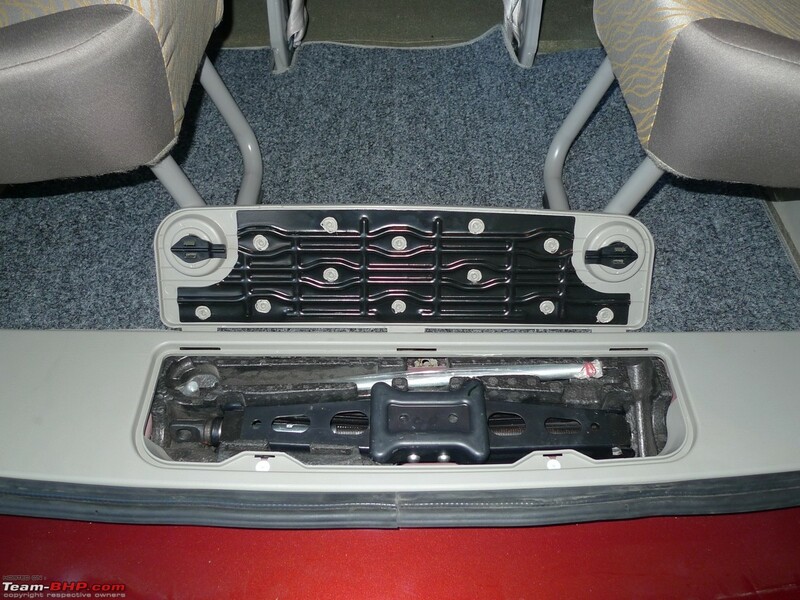 The Quanto has all of 7 bottle holders inside, each of which can hold the 1 liter variety. All 4 doors get medium-sized door pockets. Note that the pocket edges are sharp, therefore you need to be careful when picking things out of there. There are plentiful storage cubicles between the driver & co-passenger, including slots to host your smartphones. 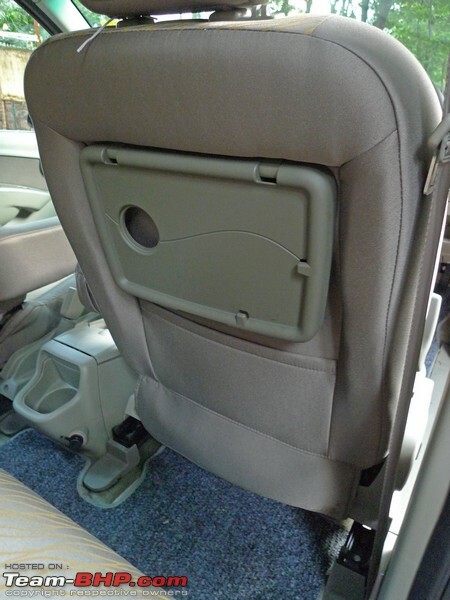 Both front seats have short seat back pockets for the odd items. 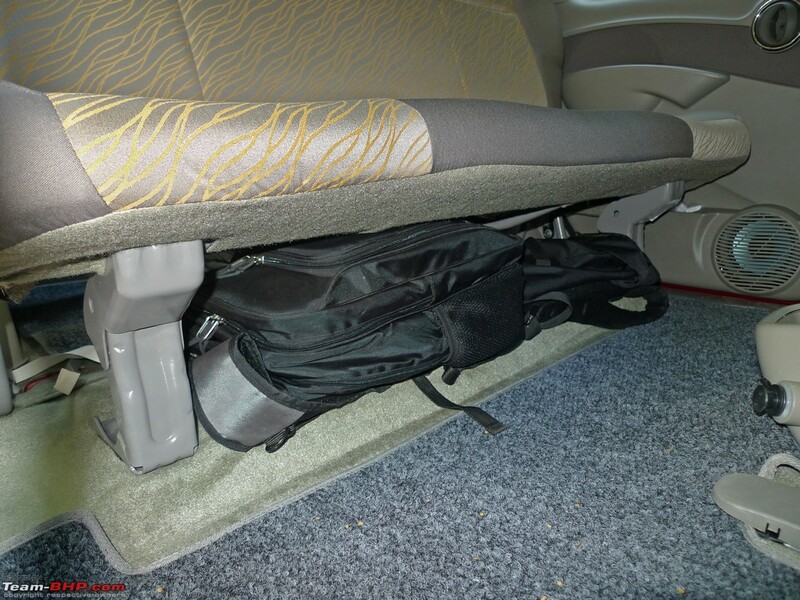 I found it convenient to dump my laptop & camera bags below the 2nd row seat. Just don't keep any items that can roll (e.g. bottle) here as, under hard braking, they can move forward to the driver's footwell. With the 3rd row seats folded away, the boot has a huge 690 liters of cargo capacity. Large pieces of luggage will pose no problem, making the Quanto ideal for airport trips. Unfortunately, the 2nd seat row isn't foldable. This greatly limits the practicality you'd expect from a utility vehicle. Last edited by GTO : 8th October 2012 at 09:54. 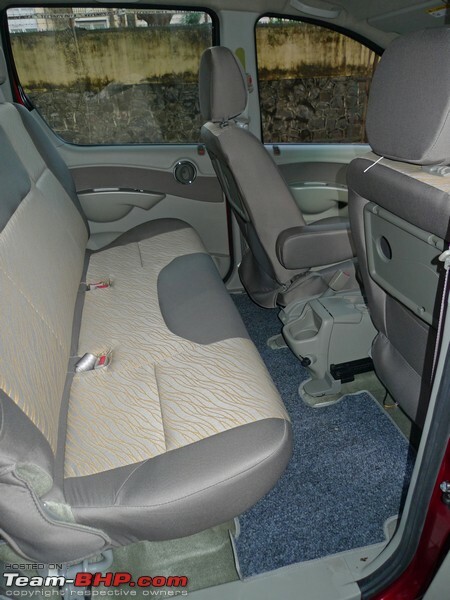 The Quanto isn't a full-time 7 seater vehicle. 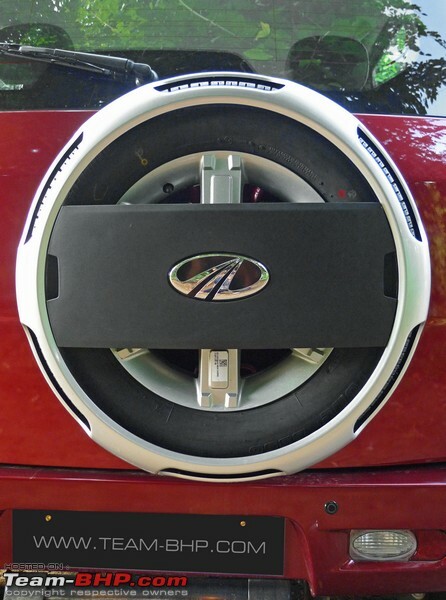 In fact, Mahindra refers to the Quanto as a 5+2 SUV. The 3rd row of seats is meant only for occasional use. 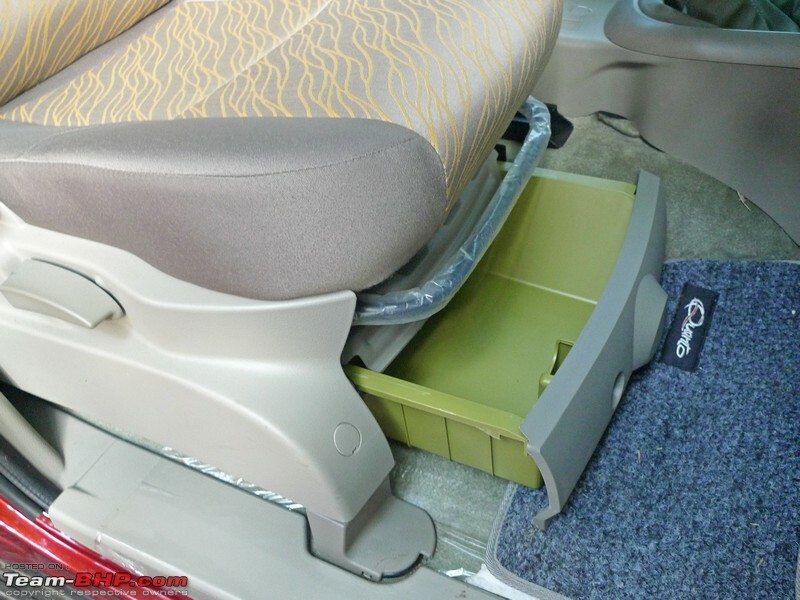 Fold them away and you have enormous cargo space for holiday luggage or even the family dog. 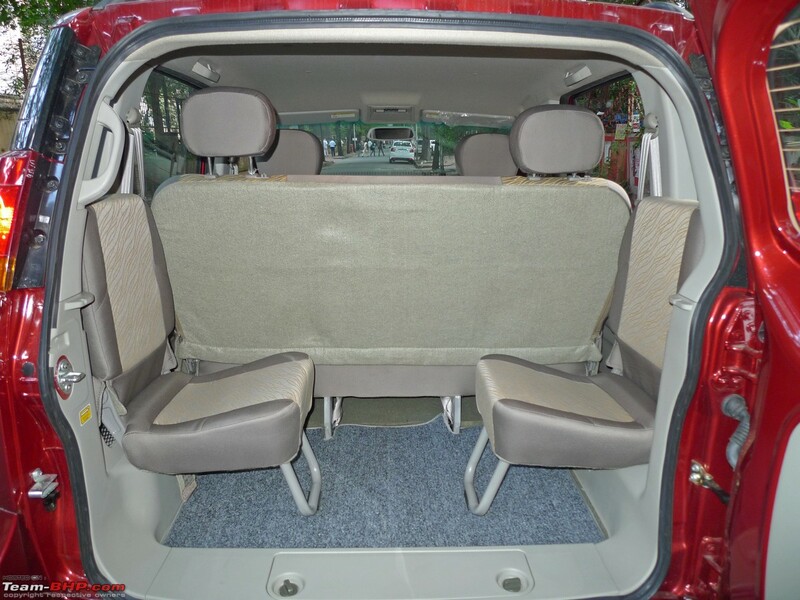 The 2 side-facing seats might come in handy on those occasions that you just need to carry 6 or 7 people...say, at a family function or an office outing. Getting into the 3rd row is easy. Use the footstep and hop right in. Once on the seat, you'll realise that this row should only be used by kids or short adults. Anyone over 5'7" will have his head touching the roof. The seats are tiny in size, while the backrest is uncomfortably perpendicular. Mahindra hasn't provided seatbelts for the 6th & 7th occupants either. 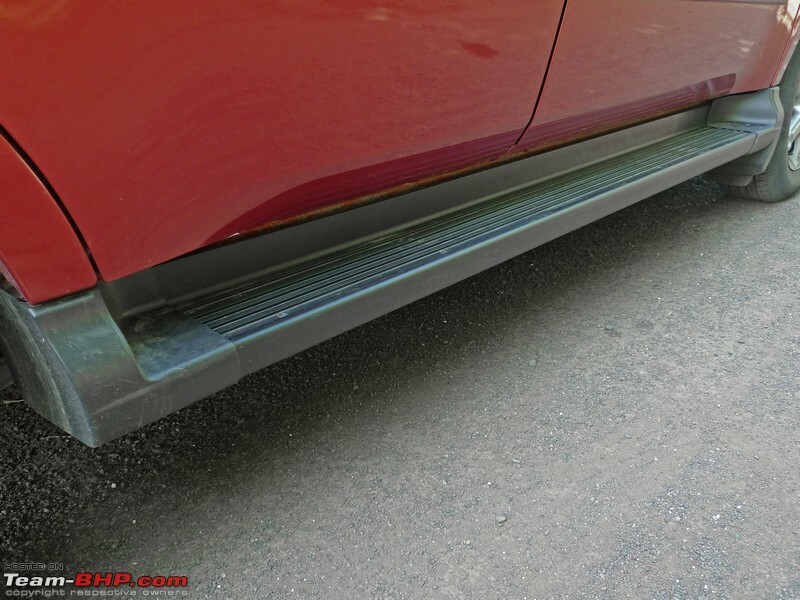 With the tail-gate closed, there was just enough width for me (contrary to perceptions). But sitting sideways in a moving car isn't for most of us; one can get car sick very soon. Ride quality here is extremely bumpy, as you are basically sitting on the axle. 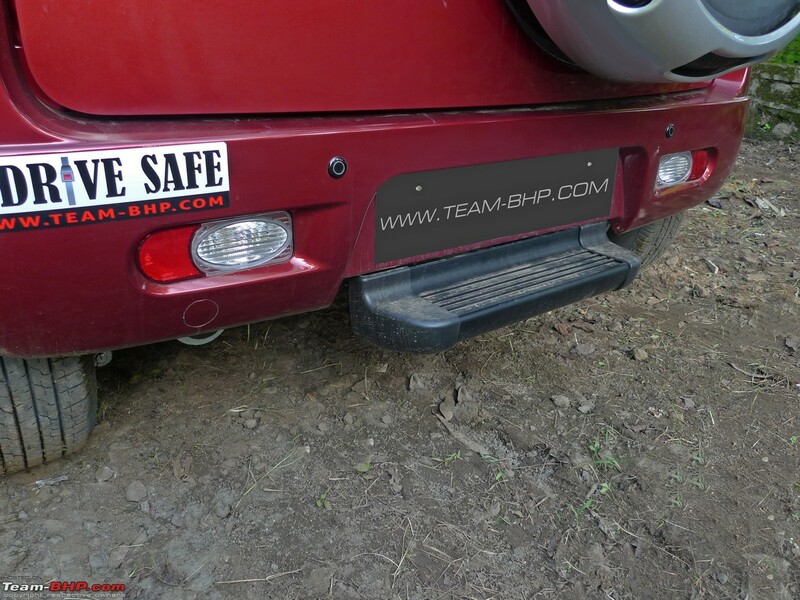 Under hard acceleration & braking, you'll keep hitting the tailgate on one side and the 2nd row seat on the other. The 3rd row seats of the Ertiga & Xylo offer far superior comfort levels as they have more space & move in the direction of the vehicle. 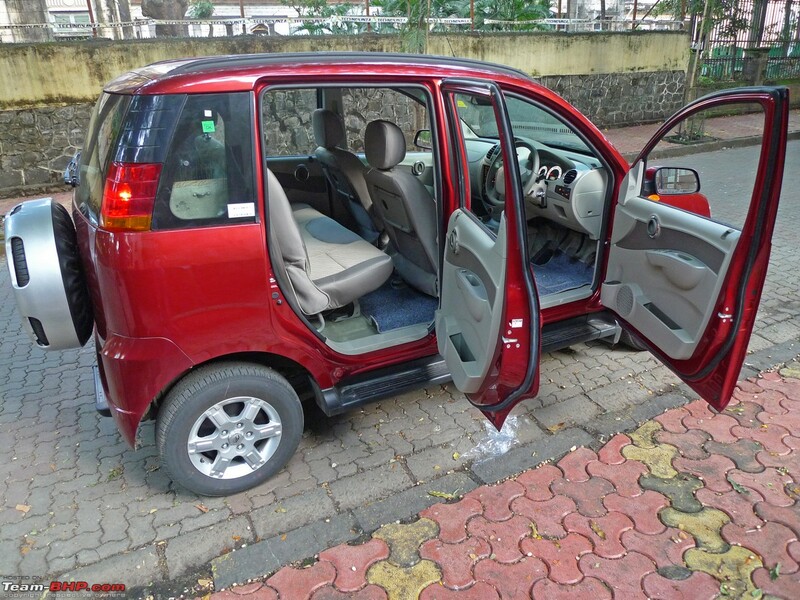 Think of the Quanto as a spacious 5 seater with a huge boot, and a 3rd row seat that's only for need-based usage. 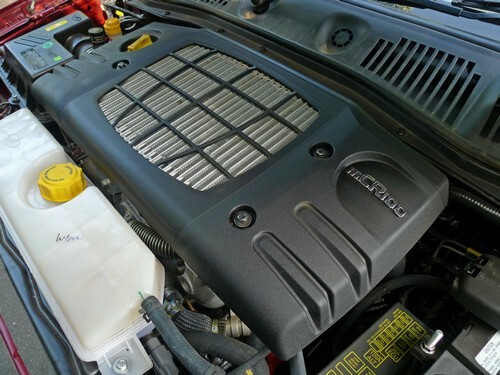 The Quanto's engine bay is the exact same size as the Xylo's. Why did Mahindra simply not plonk the Xylo's 4 cylinder 2.5L mEagle engine or, even better, the 2.2L mHawk then? Two reasons, the primary being that a smaller 1.5L engine size gives the Quanto an applicable excise duty of 12% only. The second reason has to do with product differentiation. 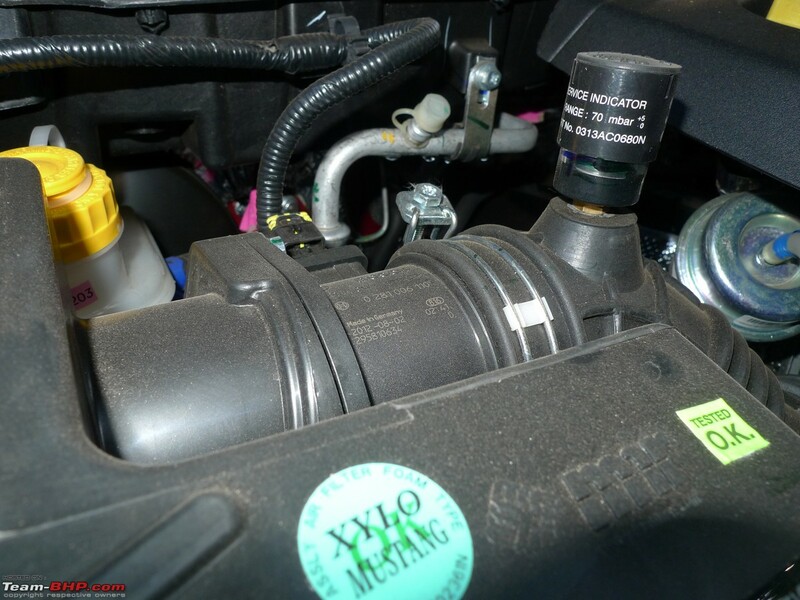 That is, the 2.2L or 2.5L diesel would have greatly bridged the product gap to the larger UVs. 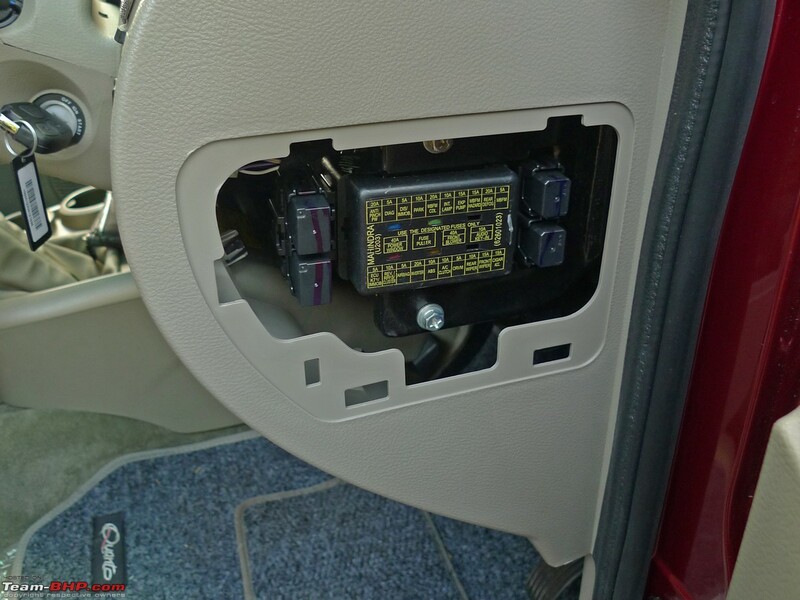 This 3 cylinder unit keeps the Quanto positioned well below the Xylo & Scorpio. This is a 3 cylinder 1493cc diesel engine. Power is rated @ 98.6 BHP (3,750 rpm) with 240 Nm of torque (1,600 - 2,800 rpm). 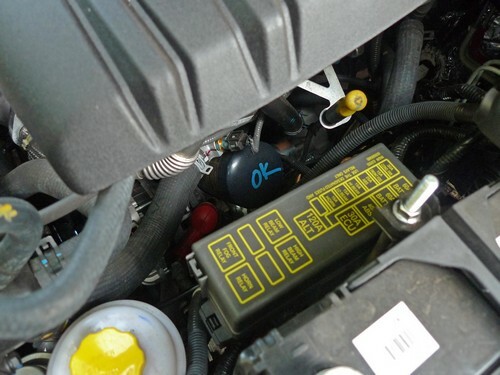 The motor is badged mCR100 where m = Mahindra, CR = common-rail and 100 = power rating in the Pferdestärke (PS) unit. It has twin-scroll turbo technology and NOT a twin-turbo (as in, two separate turbos). For technical information, click here. An all-new 1.5L 4 cylinder diesel engine would require heavy investment, expertise & time. Instead, engineers chose to chop one cylinder off the Xylo's unit to bring the size down to 1.5 liters. 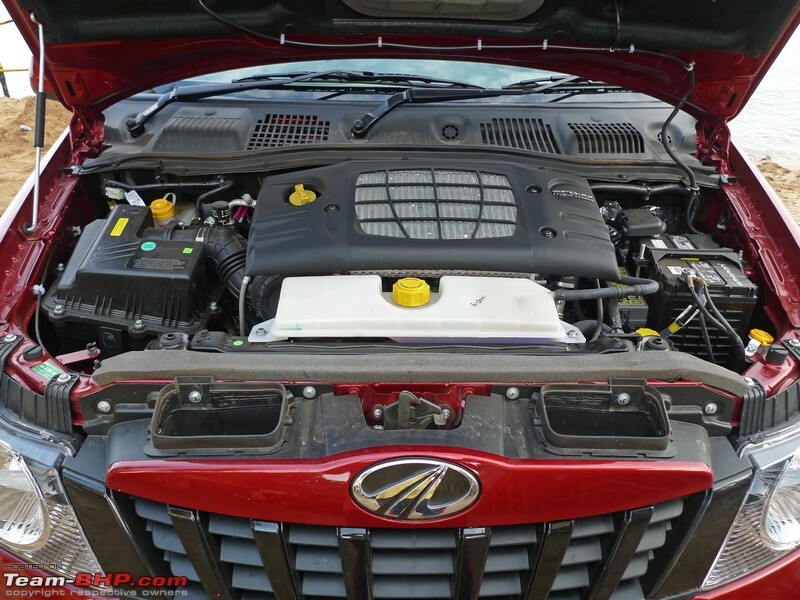 Mahindra has achieved what even VW & Skoda couldn't with a 3 cylinder diesel. Where the Polo's engine sounds crude all through the revv band, the Quanto's motor is acceptably refined. Where the Polo suffers from heavy turbo-lag, the Quanto has excellent city driveability. 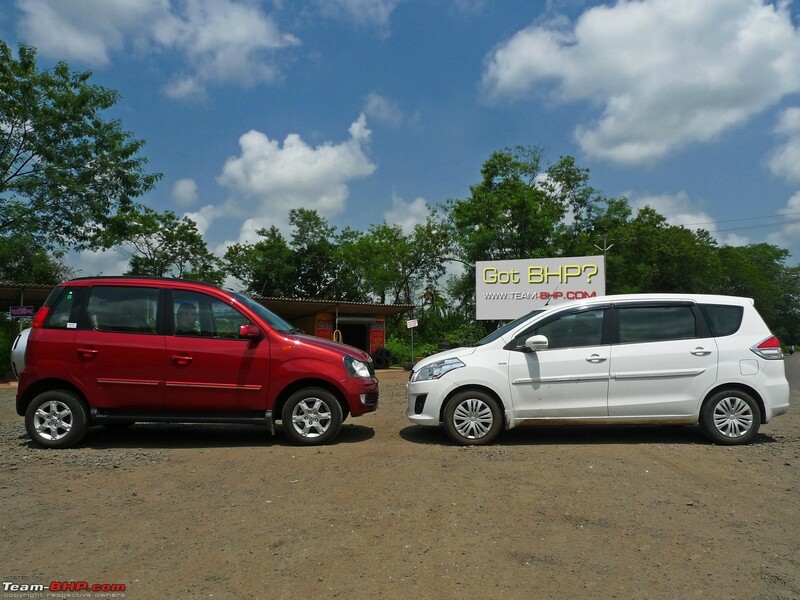 The Quanto's engine is actually among the better 3 cylinder engines in the country. It would be interesting to see what this motor can do in a lighter vehicle. Fire the engine up and the entire body & gearbox shake, as if being rudely awakened. 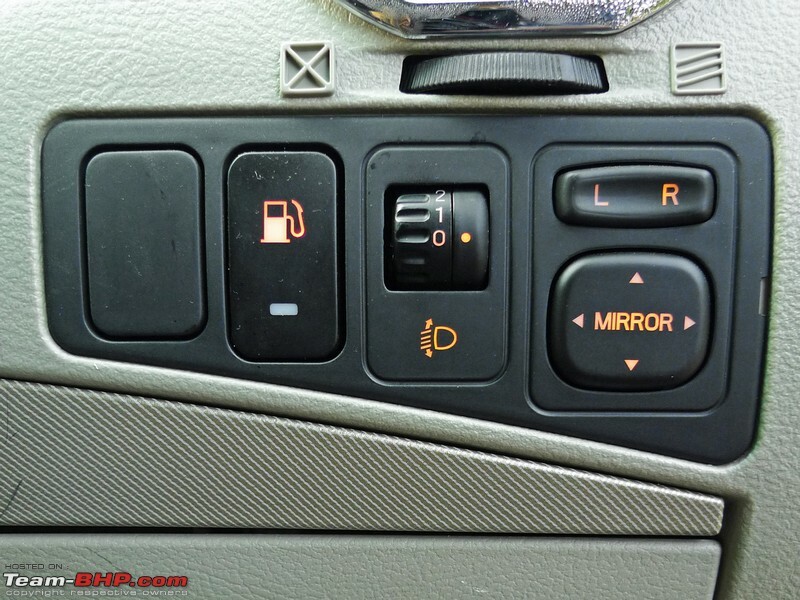 Switching the engine off isn't any less an unrefined exercise. 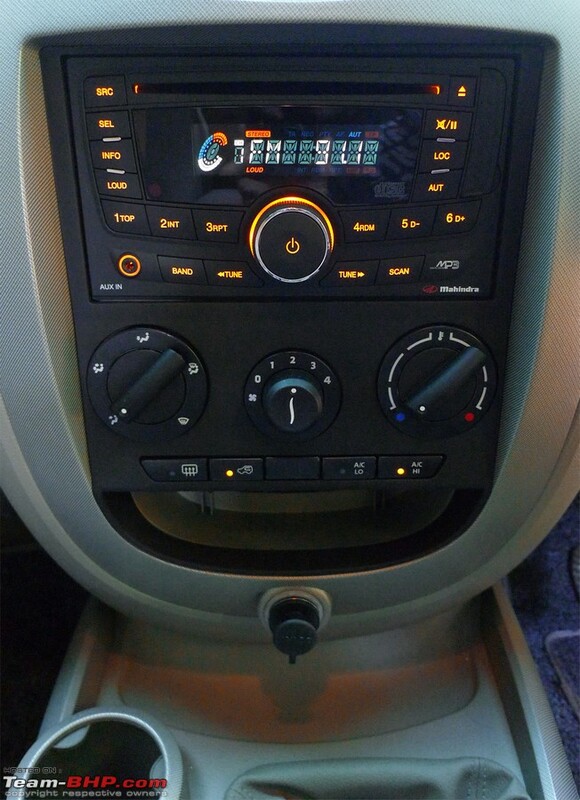 Once warmed up, the Quanto sounds just like other Indian UVs running 4 cylinder engines. 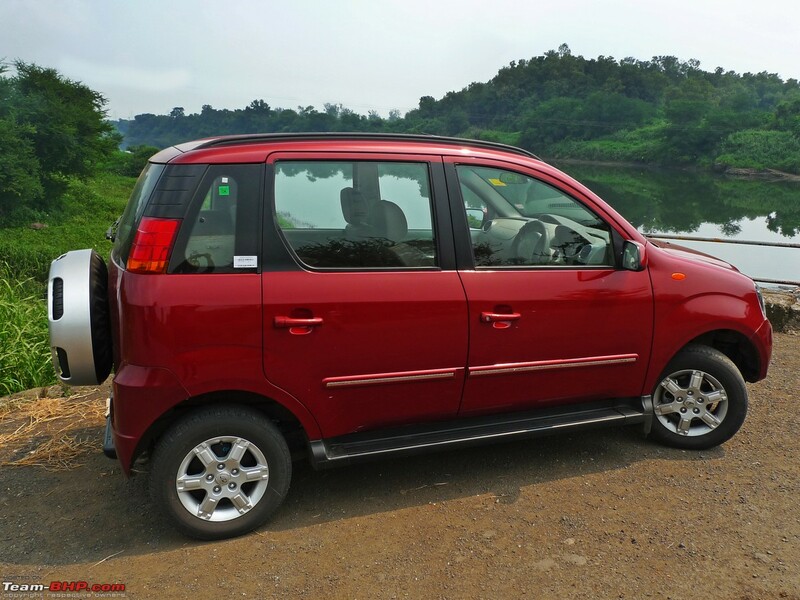 From the Bolero to the XUV500, Mahindra's cars usually have good driveability and the Quanto is no different. The engine starts pulling from 1,500 rpm itself. There is some lag below that level, yet it's within acceptable limits. The purpose of the Quanto's twin-scroll turbo is to minimise turbo lag at low rpms, and it really does deliver. The motor is immensely tractable in the city and makes light work of traffic conditions. For a normal driving style, the motor has superb driveability. The gear ratios are perfectly chosen to extract the best out of this engine and it never feels lethargic this side of 100 kph. As good as the driveability is, the Duster 85 remains the benchmark amongst SUVs. On the flip side, most Quanto owners will complain about noticeable engine & drivetrain vibration between 1,000 - 1,300 rpm which can be felt throughout the vehicle. This shuddering is typical of most Mahindra & Tata UVs and is only at the initial stage; it smoothens out after 1,500 rpm. 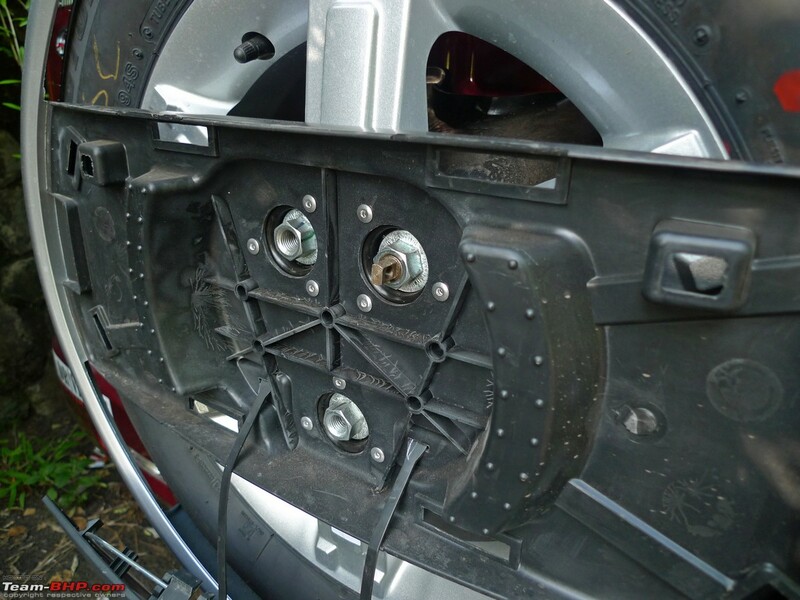 The vibration is most prominent when you lug the engine. Power delivery is linear in nature. There is none of that sudden turbo whoosh, with power coming in a progressive manner. In-gear performance is great within the city and at speeds less than 120 kph. Above that, the car starts running out of breath. The Quanto's power to weight ratio is on par with that of the Xylo & Innova, and performance is at a similar level. In fact, you could compare it to hatchbacks like the Figo & Punto 75 too. It's not a tarmac burner, far from it. Yet the Quanto is an able cruiser. By UV standards, upto 120 kph, the vehicle doesn't feel under-powered at all. Power on tap is adequate for point A -> point B commuting. Of course, with a full load of 7 passengers onboard, performance will substantially deteriorate. 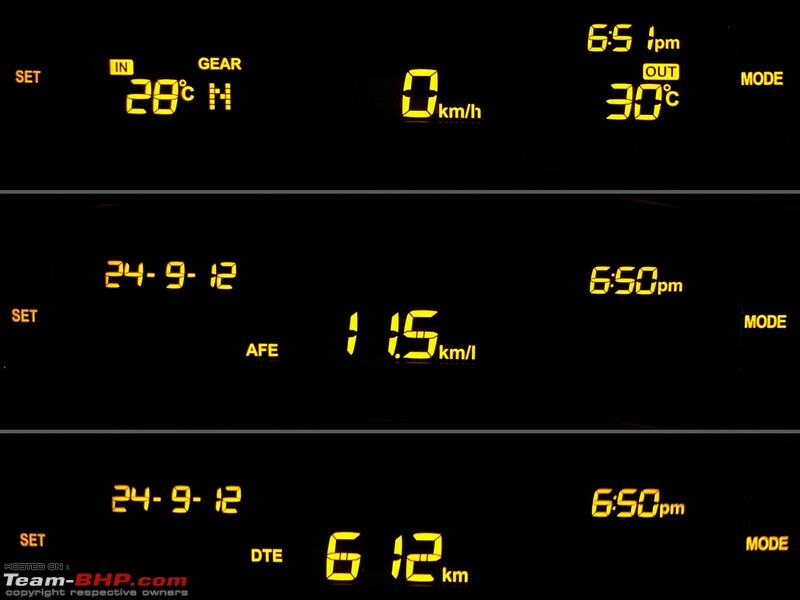 In terms of cruising, 80 kph is seen @ 1,950 rpm while 100 kph comes @ 2,450 rpm. Power delivery is constant till 4,000 rpm and the max rpm level is 4,800. 3 cylinder engines are inherently more fuel-efficient. The Quanto's ARAI rating of 17.21 kpl is significantly higher than other body-on-frame UVs. For instance, the Xylo's best ARAI rating is 12.92 kpl. The ECU switches the air-con compressor off when the accelerator is fully pressed. This setting is too sensitive and I found it annoying how the cooling would stop under the hot afternoon sun, just because I had to work the engine in an overtaking manouveur. 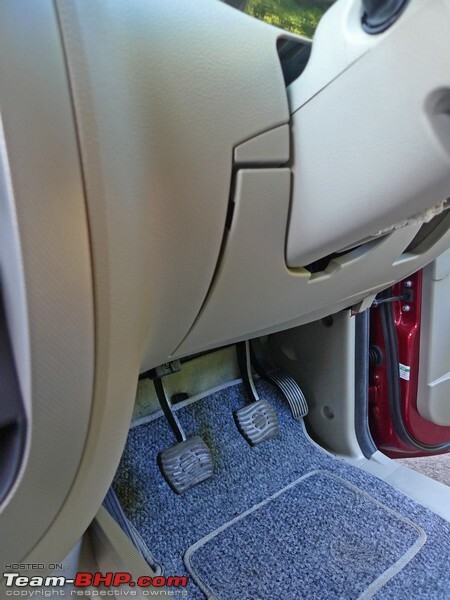 Quanto owners might do well in using the accelerator pedal only 80% of the way on bright summer days. The gearbox has super long throws while shift quality is rubbery too. It's not going to win any fans. 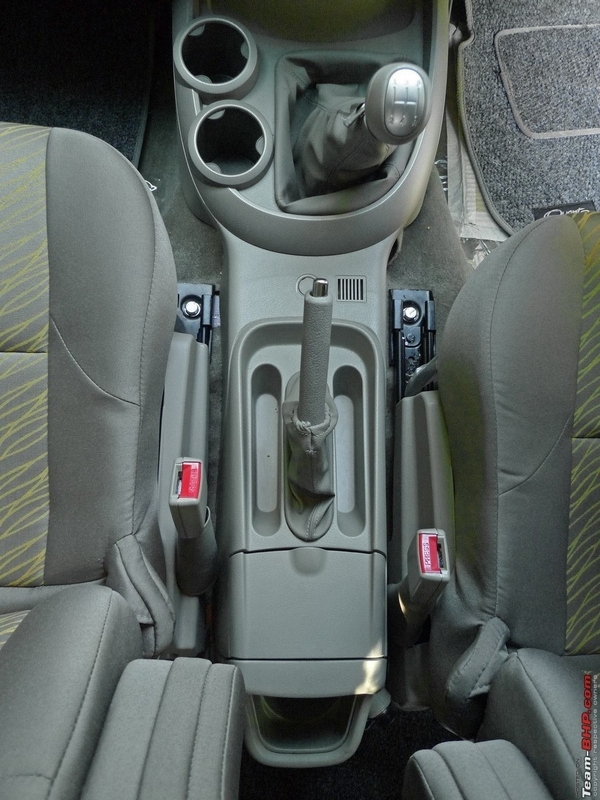 Then, as mentioned in the interior post, the gear lever is awkwardly positioned. 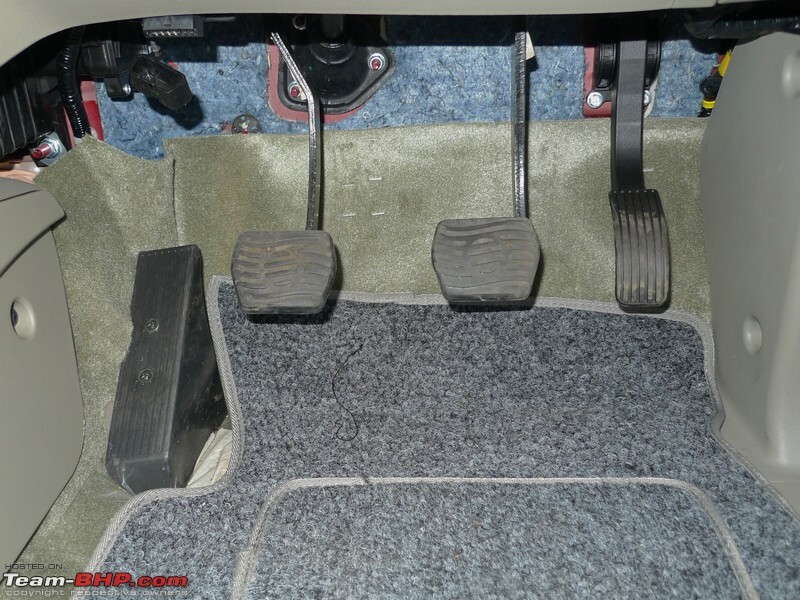 The clutch pedal is nowhere as light as equal-price sedans and does require a certain amount of effort to use. It's weight will be annoying in bumper to bumper traffic. Engine noise levels are on par with other homegrown UVs and their 4 cylinder engines. 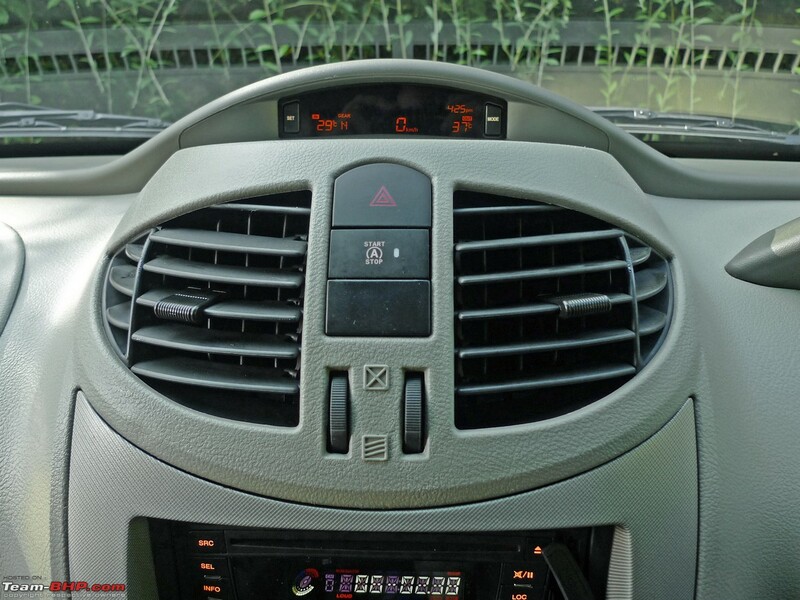 You won't complain about lack of refinement due to its 3 cylinder layout at all. Above 3,000 rpm, you do hear the classic 3 cylinder thrum, but it's not excessive. Passengers won't even know about the missing cylinder under the hood. In other areas of refinement however, the Quanto fails to meet expectations. You'll feel a lot of vibration on the gear lever while driving. 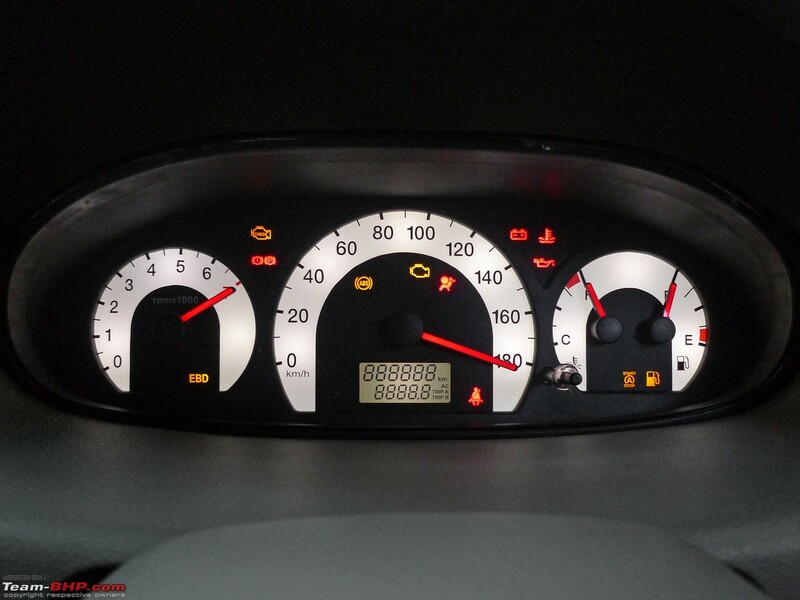 As mentioned earlier, there is a substantial amount of shake at engine start up & switch off, as well as at high rpms. The clutch pedal transmits a noticeable amount of engine vibration that’s directly proportional to the rpm level. When driving the Quanto over bad roads, everything (literally!) moves & shakes on the inside. I was checking out the middle row seat when we encountered a rough piece of tarmac. 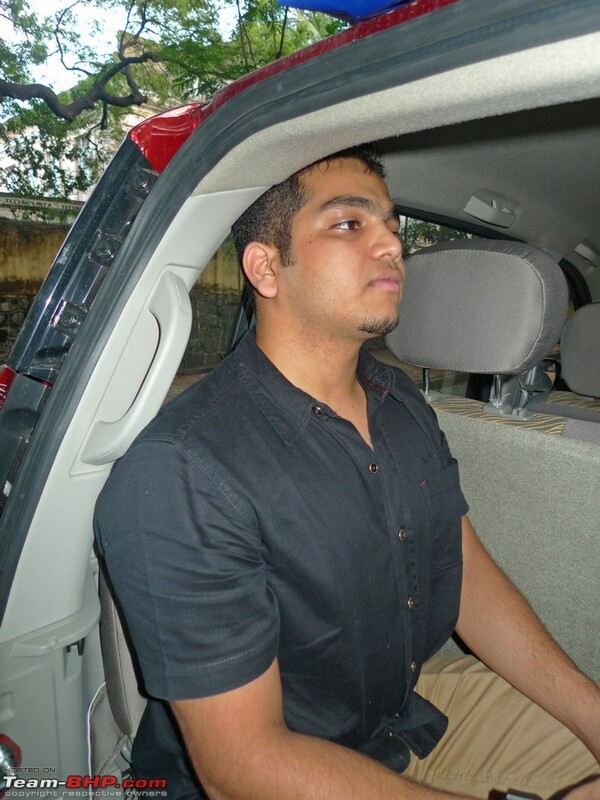 The empty co-passenger seat shook vigorously from left to right! The Quanto is equipped with an engine start-stop system that Mahindra funnily calls Micro-Hybrid (there's nothing hybrid about it). Interestingly, the Xylo still doesn’t have this function. 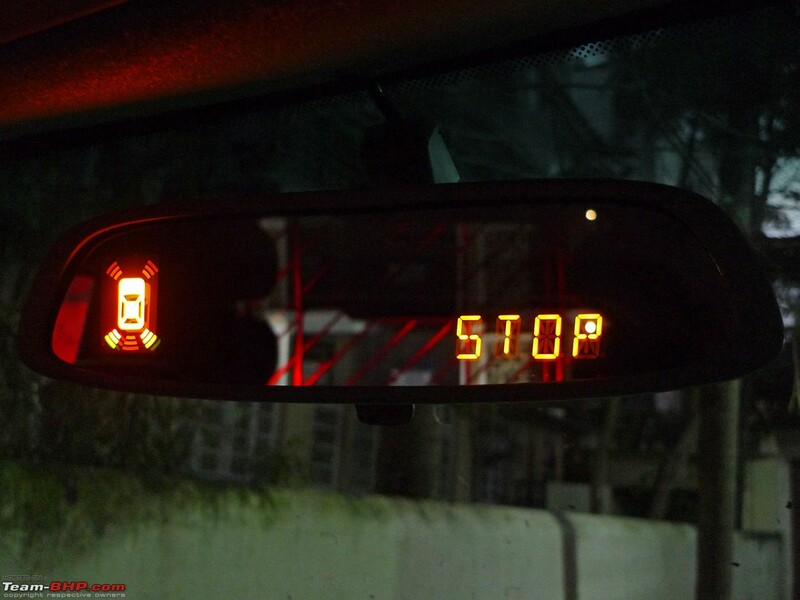 The start-stop system switches the engine off, after you move to neutral gear at a standstill. The engine restarts as soon as you press the clutch. Of course, if you don't take your foot off the clutch, the engine won't switch off at all. This system's objective is to maximise fuel economy. Why burn diesel when you are standing in one place? However, the system isn't practical in India. For one, the air-con compressor stops running. That's the last thing you want in traffic on a hot day. 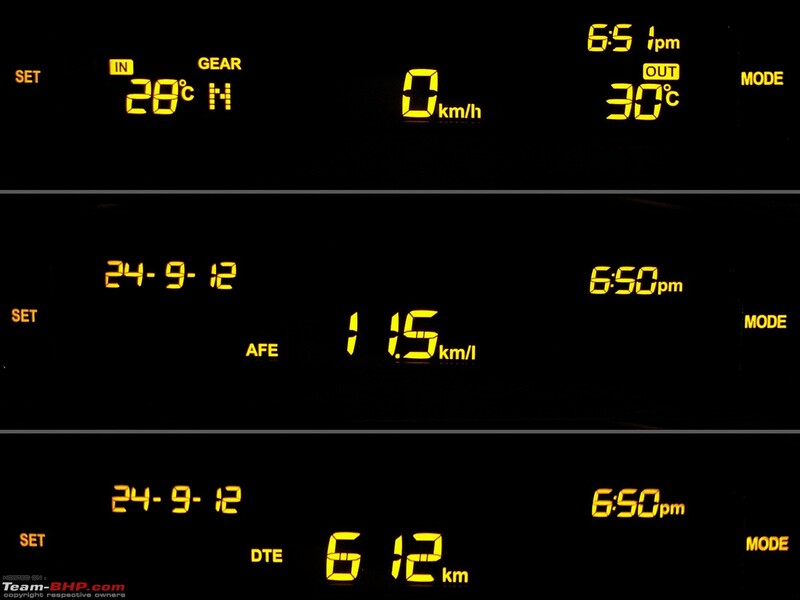 Then, the engine start & shutdown sequence isn't seamless at all; the Quanto's body, engine & gearbox shake vigorously. Even the most die-hard fuel economy fan will find this annoying and keep the start / stop function permanently switched off (as we did). Good thing that the system remembers your preference and doesn't reset itself after you switch off the Quanto. Unfortunately, the Quanto has retained the Xylo's imbalanced road manners. Ride quality within the city is liveable, yet far from plush. The Quanto's suspension is extremely jiggly in nature. It's never flat or planted, even on concrete expressways. You are always aware of the kind of surface you are travelling on. When road conditions deteriorate, the suspension gets bumpy and, on the highway, there is a constant up / down motion, especially at the rear. 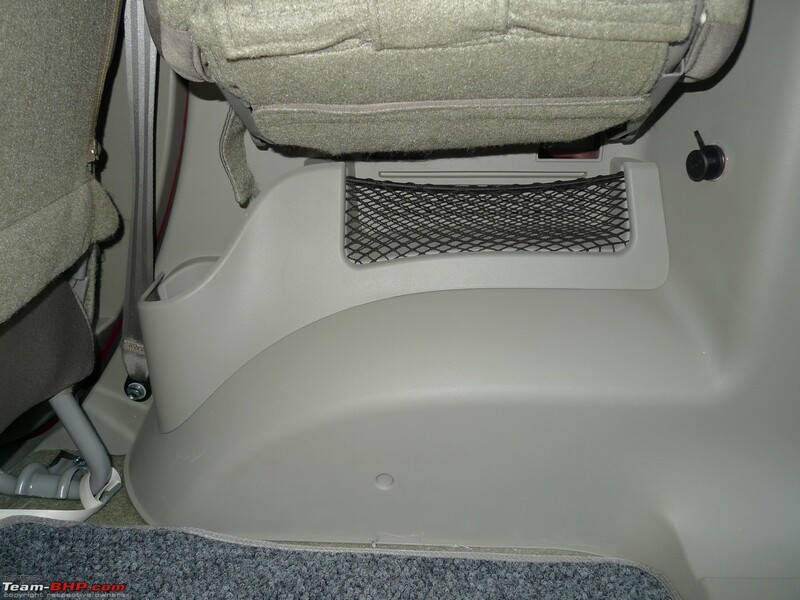 The excessive body roll can further make passengers uncomfortable and large bumps send a serious jolt to the inside. 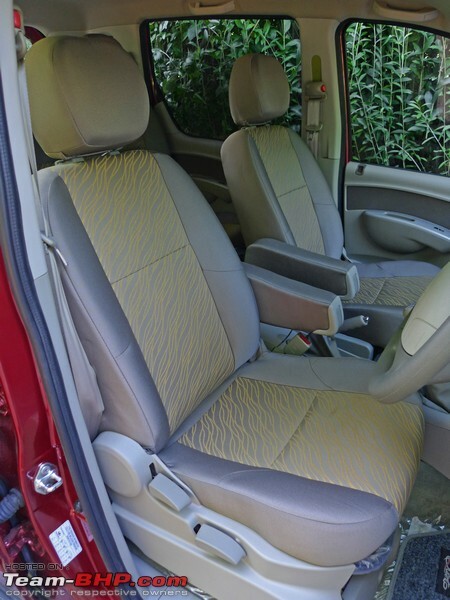 If the driver has a slightly aggressive style, passengers will literally get thrown around their seats. Tuning a suspension is tricky business, one that Mahindra just hasn't gotten a hang of (the XUV500 is an exception). 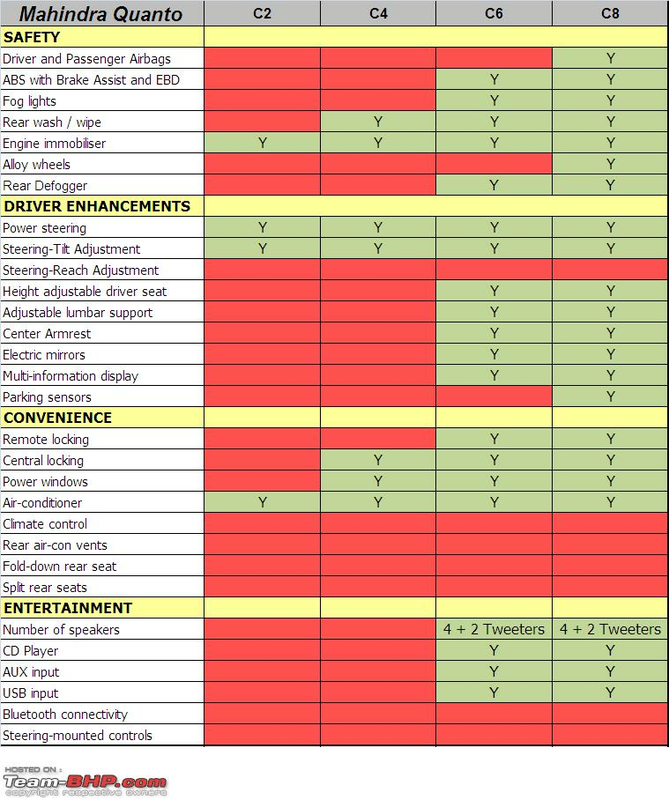 Amongst SUVs, you either have the type that ride well but are dynamically lousy (e.g. the Tata Safari). Or you have brilliant handlers with a poor ride (e.g. Honda CRV). Few hit the sweet spot between ride & handling (e.g. 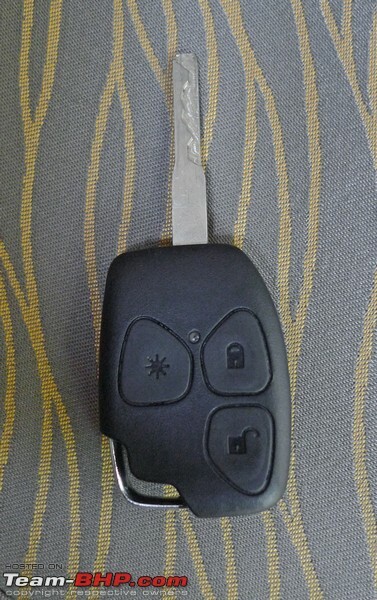 Renault Duster). Unfortunately, the unnecessarily tall Quanto does neither too well. Behaviour is par for the course at speeds less than 80 kph. But you must always maintain a light foot. Even a moderately quick lane change results in significant body roll. Forget cornering, a fast lane change alone will scare the wits of you. 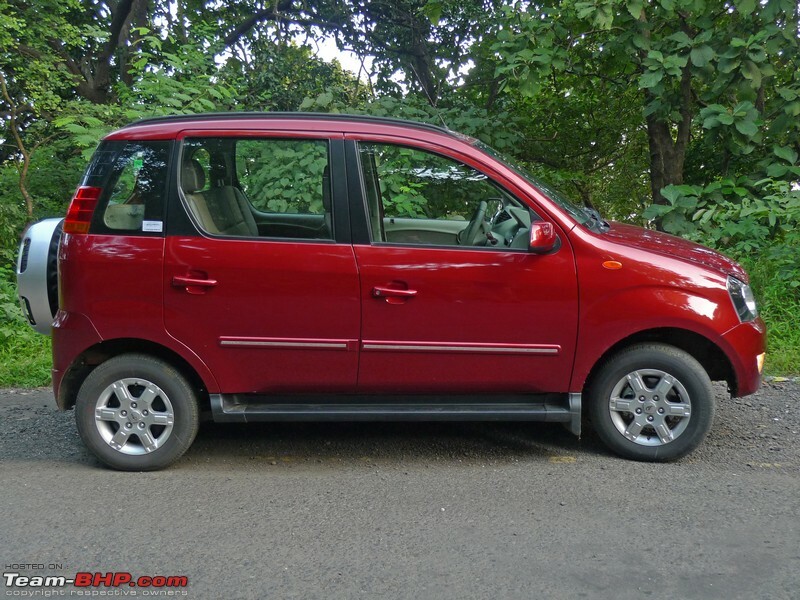 The Quanto is dynamically very poor and I strongly recommend driving it in a safe, conservative manner on the highway. Always take corners at moderate speeds. Though the engine is capable of propelling you to 120 kph and beyond, you just won't feel safe at that speed. 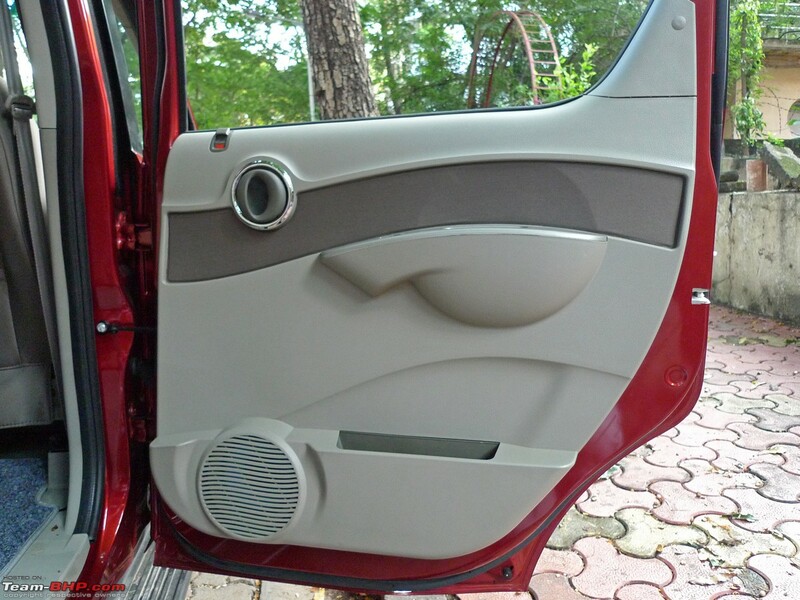 Cars like the Duster & Ertiga run rings around it in the dynamics department. I must add that grip from the Bridgestone B390 tyres isn't too bad, but the body roll & chassis behaviour will make you back off. The steering isn't anything to write home about either. It's a throwback to the old Mahindra days. The steering wheel is very imprecise, has slow reaction times and the center-back action is strange & unpredictable. Also, you must keep in mind that it does require some effort at parking speeds. Braking ability is average. The pedal feels mushy, yet in terms of stopping power, the Quanto did just alright. There is a significant amount of brake dive from the front though. As with any other Mahindra, the Quanto handles rough roads with aplomb. After spending some time behind the wheel, we weren't even slowing down for broken roads. Mahindra underpinnings are always at home in a rural India setting. 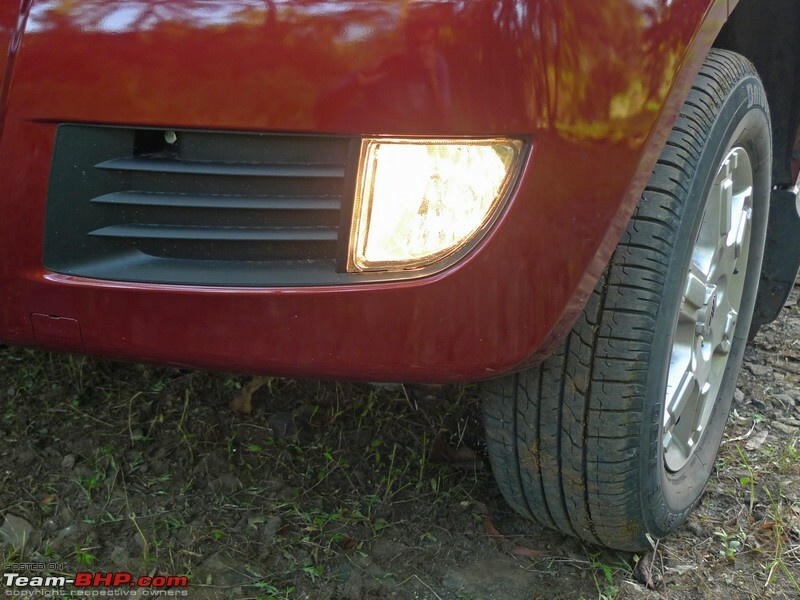 180 mm of ground clearance should suffice for the worst of our driving conditions. The UV's short length makes city parking effortless. 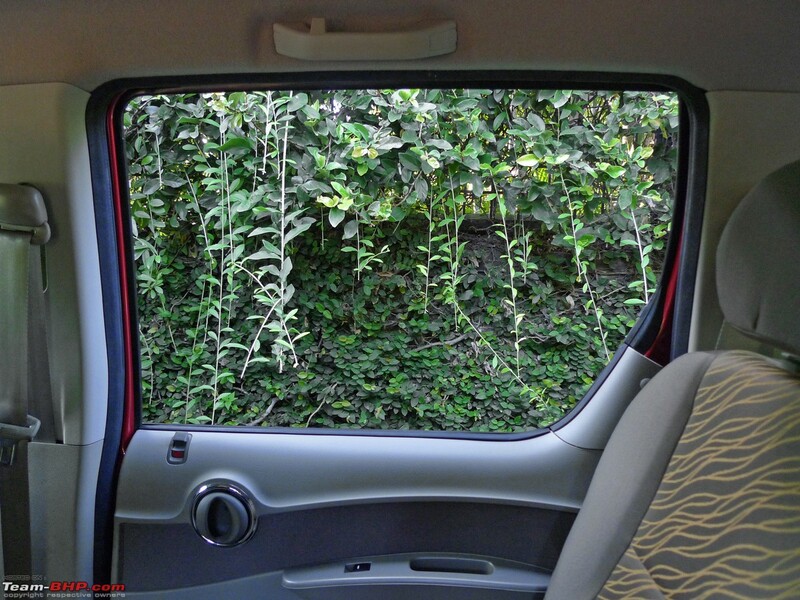 You can squeeze the Quanto into small spots that a full-size SUV would only dream of. The turning radius is a reasonable 5.4 meters. •	Team-BHP broke the name of the Quanto and had uncovered pictures to boot in this scoop thread! 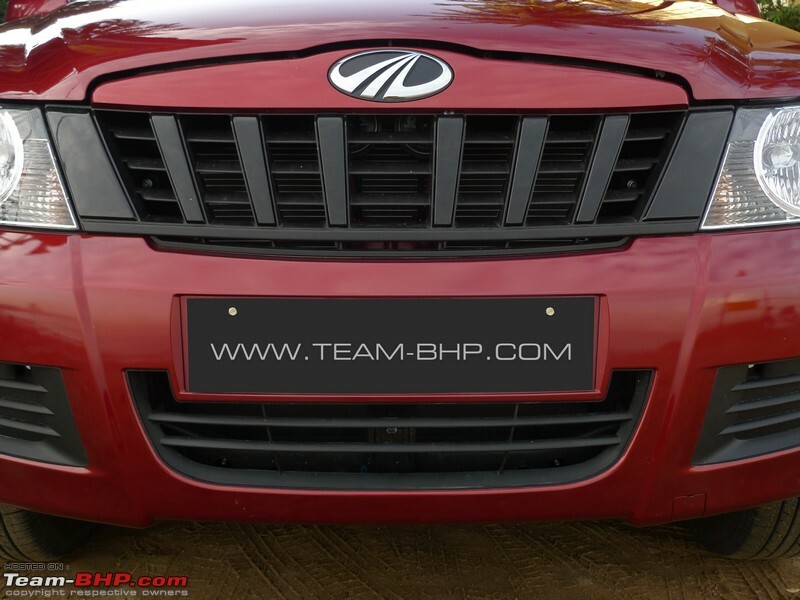 Quanto continues the tradition of Mahindra UV names ending with an “O”. •	This is Mahindra’s 4th new utility vehicle since 2009. Later in October, the company will launch the Rexton, it's 5th. In the same time period, Tata has only brought one new UV to market, the Aria. Tata effectively handed the UV market to Mahindra on a silver platter. 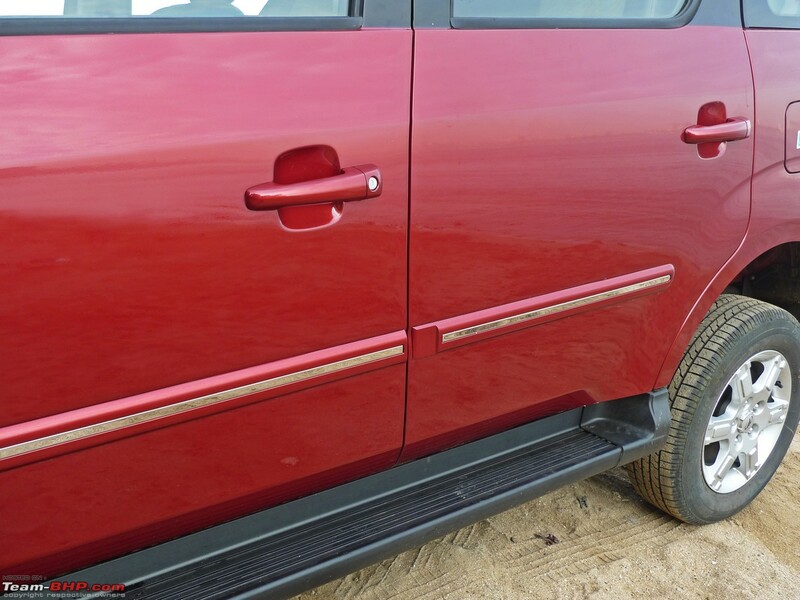 •	This is the 3rd vehicle on the Ingenio platform, after the Xylo and Genio pickup truck. 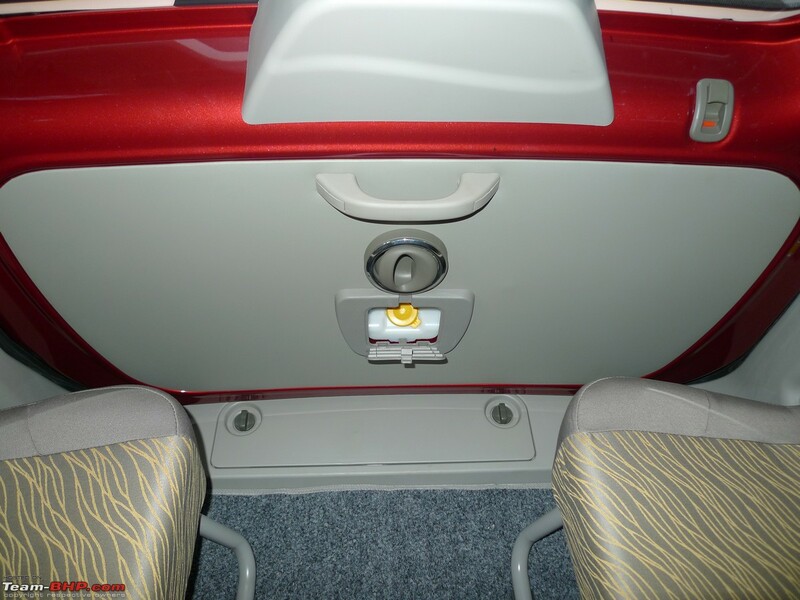 Mahindra has given strict instructions to its dealers to refrain from calling the Quanto a "Mini Xylo". •	The mCR100 3 cylinder engine will be used in other Mahindra's, including personal as well as commercial vehicles. This engine would be something else in a light-weight car. •	The 2nd row seat should definitely have had better cushioning. If you are looking at buying the Quanto, get it fixed in the after-market for cheap. Beefed up cushioning and a more comfortable recline angle should cost less than 10K. •	A 4x4 Quanto is on the horizon. It will be using the mHawk 4 cylinder engine instead. Mahindra is betting on export markets for demand. 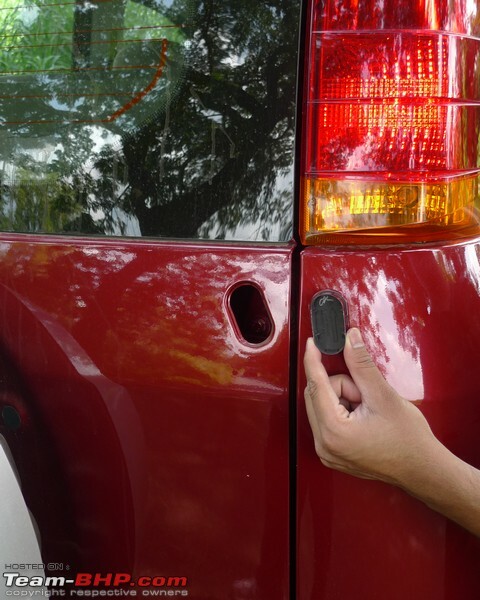 •	Doors auto-lock once you hit 30 kph and unlock when you switch the engine off. •	The start / stop system must put a lot of load on the battery and starter. Hopefully, these components have been sufficiently upgraded to handle the extra work. The start / stop feature is in conflict with our belief of turbo idling (Related Thread). 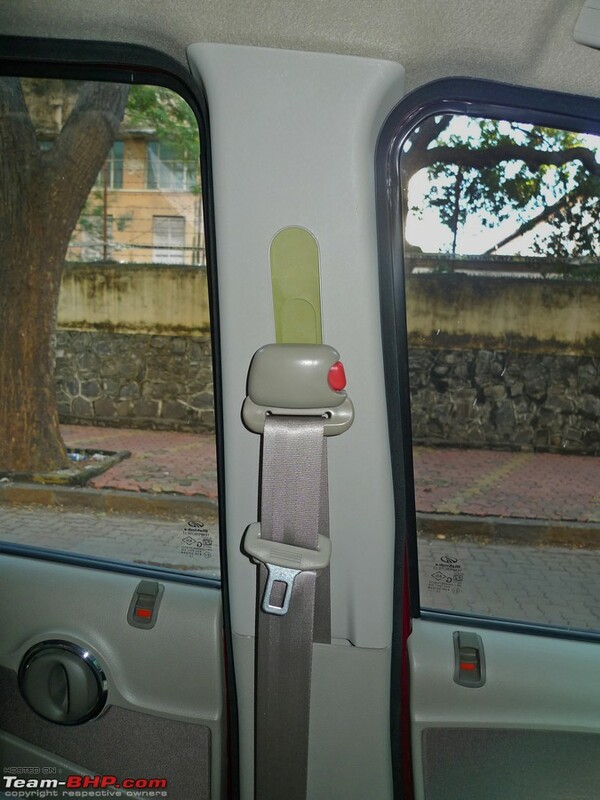 • When getting off from the 2nd row seat, tall passengers will have their feet fouling with the B-Pillar. The gap is less than ideal. •	If you leave any door open, a loud warning buzzer goes off. The instrument console indicates that a door is open, while the central MID screen shows you exactly which door needs to be secured. 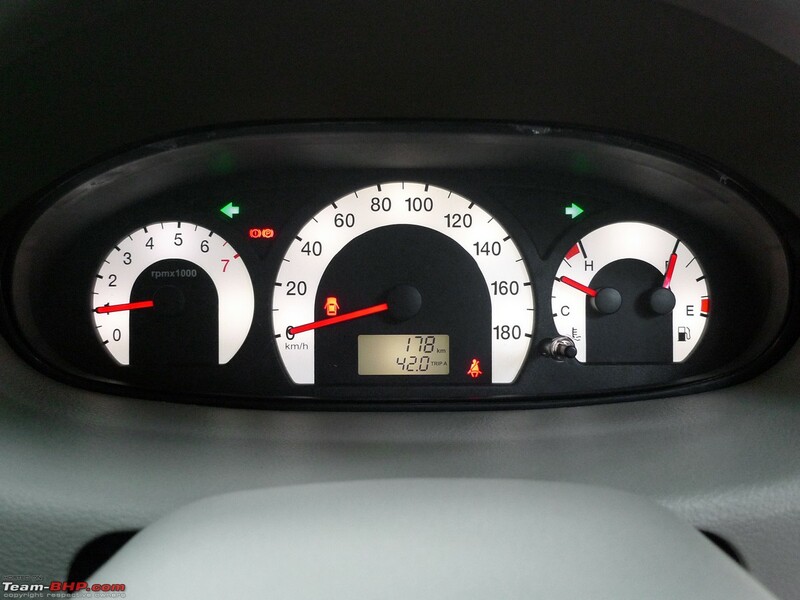 •	You can set a speed limit buzzer in the Quanto. 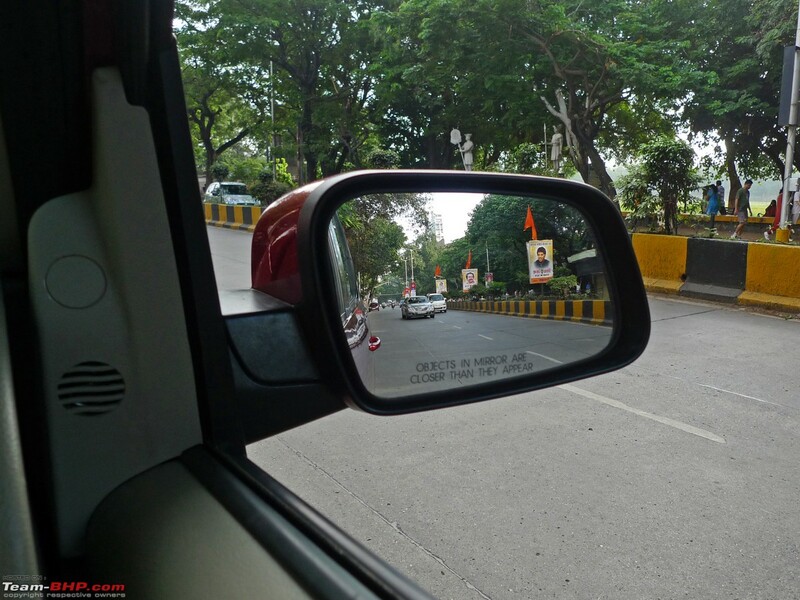 Basically, the driver's crossing a predefined speed limit will result in an audible alarm. 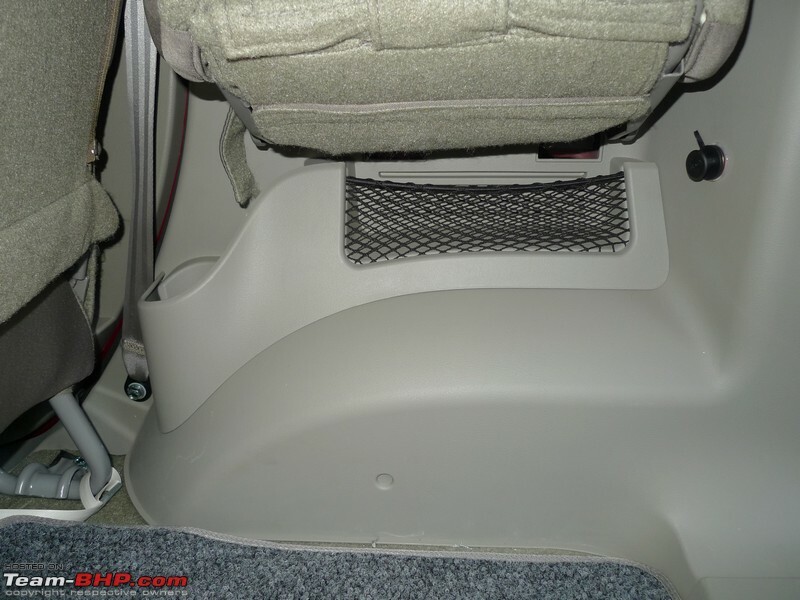 •	The stock dual-tone horn sounds nice for an OEM piece. •	There were rumours of Mahindra developing a petrol engine for the Quanto. You can't argue with them for not offering it. Petrol UV’s never sell and with a 1,640 kg kerb weight, fuel efficiency would've gone for a toss. •	Considering that this car looks just like the Xylo, I didn't expect the aam junta to have much of an interest in it. Boy, was I wrong. Everywhere we stopped, people came up to check it out. Some even took pictures. What was surprising is that few knew what the name is. Most called it the "Chota Xylo" (Mini Xylo). •	Whatever small market the Premier Rio had, it's dead with the Quanto's arrival. •	The Quanto will be popular with the taxi market. It's more fuel-efficient and cheaper than the usual options. The 3rd row is cramped, but how often do you see a cab with 7 onboard? 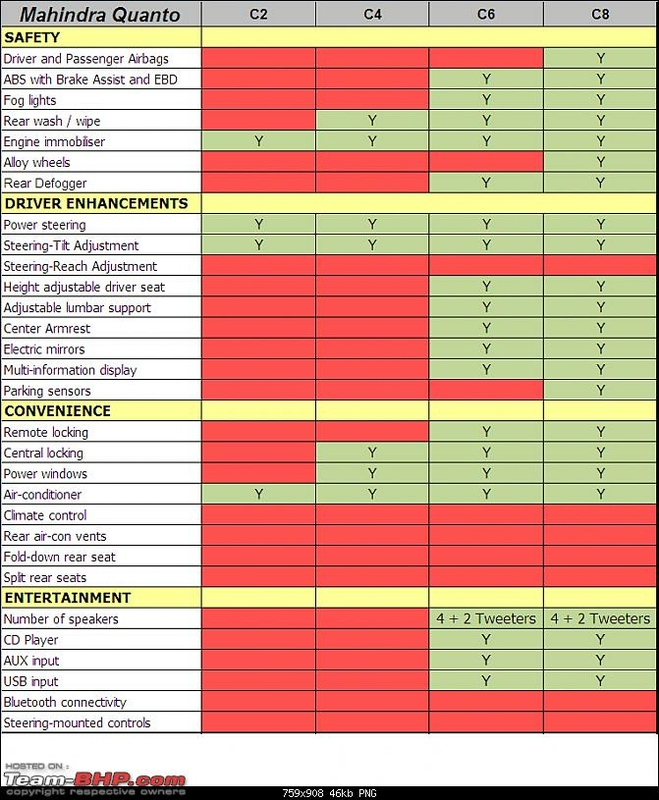 Most hired Innovas & Taveras carry 2 - 4 passengers only. The Quanto will be cheaper to buy and to rent. Cab drivers might just prefer the Quanto to equivalently priced sedans like the Logan, Etios & Dzire. The base model is clearly not for private owners and has been targeted at the taxi market. 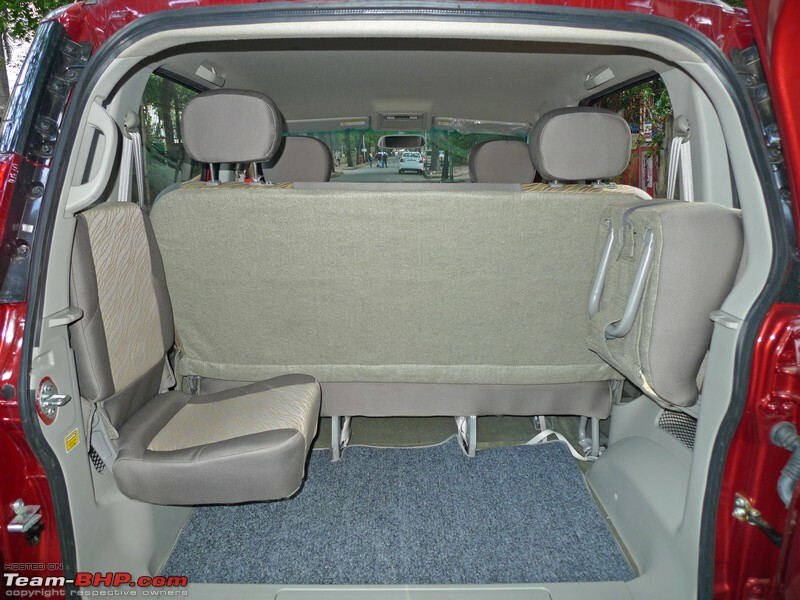 It lacks body coloured bumpers, spare wheel cover, side and rear footsteps, power windows, central locking etc. •	Say you live with an i20. With time, you'll find smaller stuff that impresses in its attention to detail. 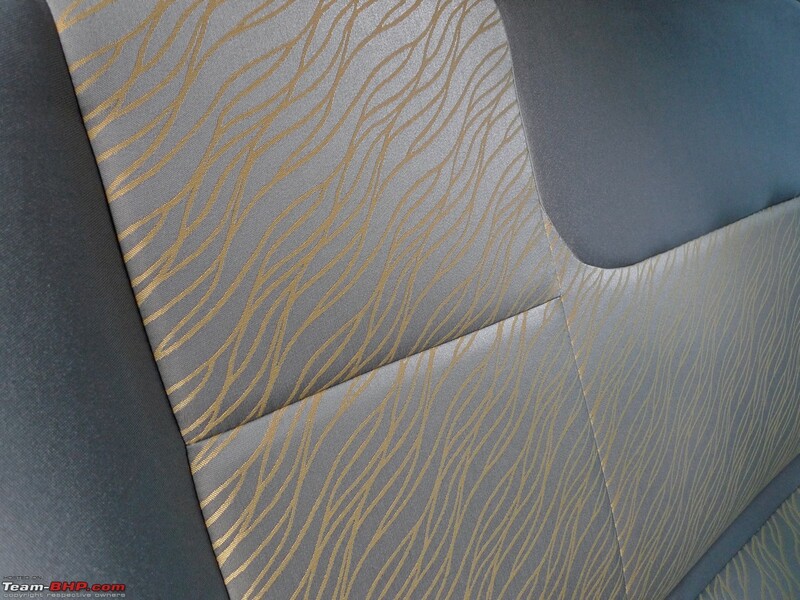 With the Quanto's interiors, you'll keep finding more & more rough edges by the day. 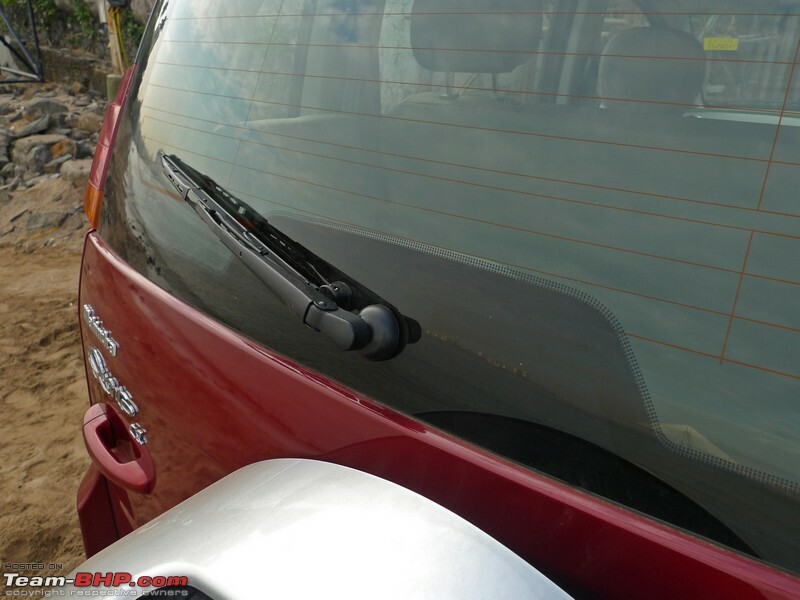 •	Very good wipers, they have a massive sweep area. 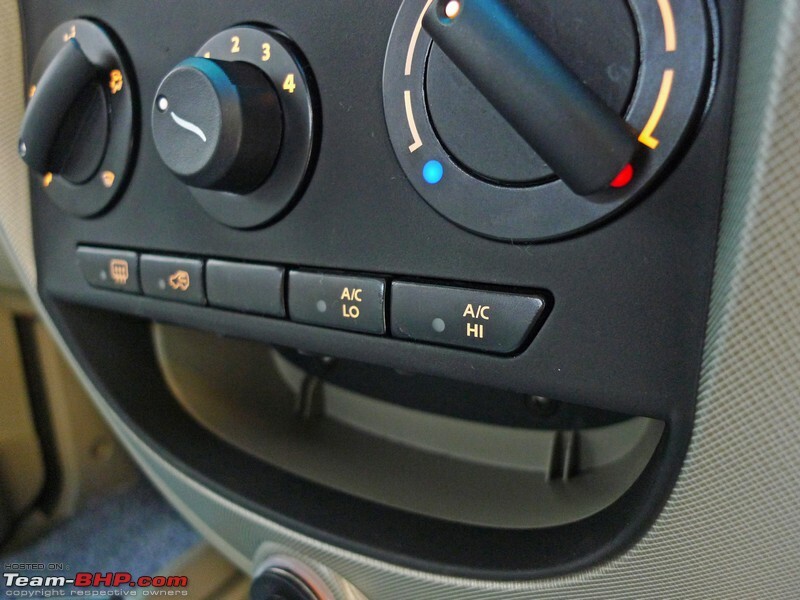 The wipers have an intermittent function, but there is no adjustable timer or delay. 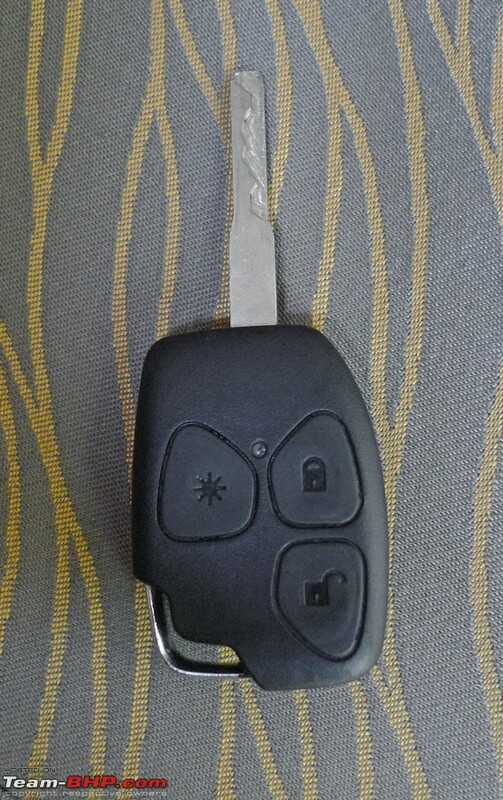 •	The Quanto needs a central lock / unlock switch. It's quite a pain to always lock & unlock from the door pull up / push down lever. • Gear display shows you the currently chosen ratio, but it is buggy. 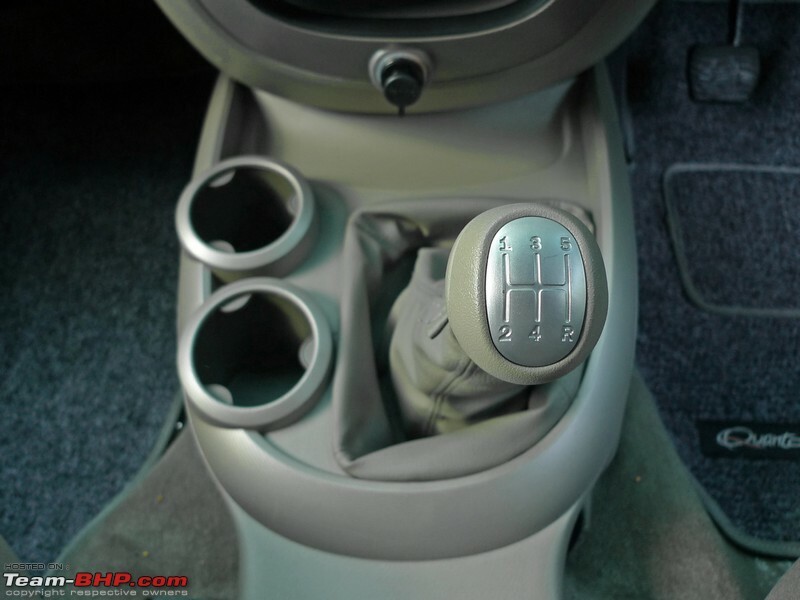 If you shift to neutral at speed, it'll still display the 4th or 5th gear (depending on speed). 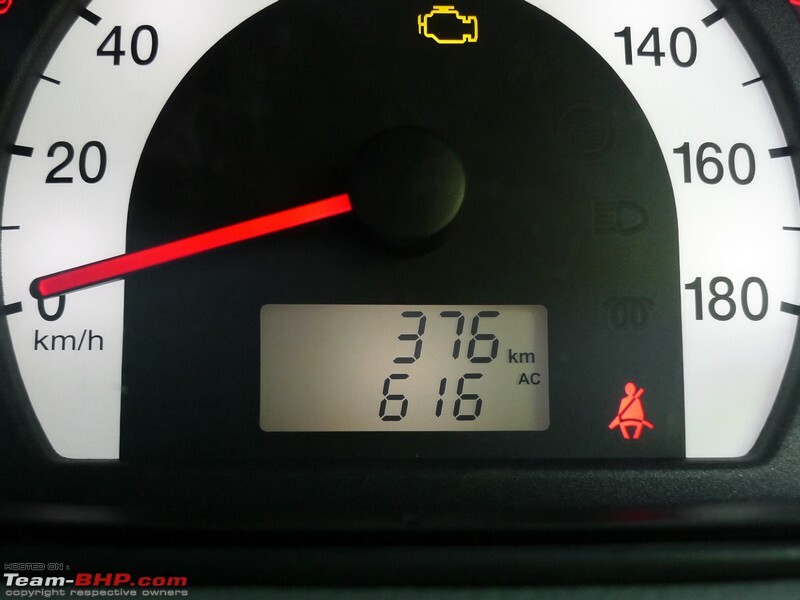 •	Good fuel tank capacity of 55 litres should give the Quanto a long highway range. •	The Quanto is a mere 145 kilos lighter than the huge XUV500. 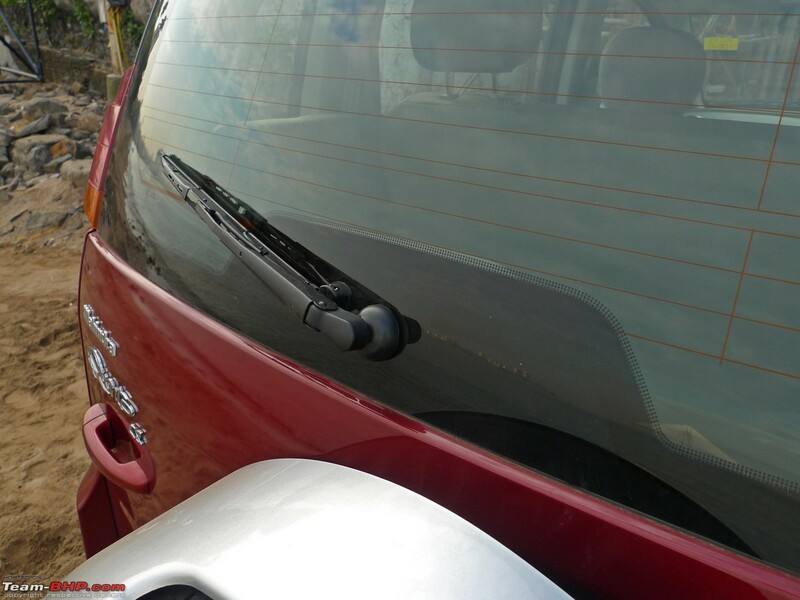 •	Remember to secure the butterfly windows every time you park the car. It's very easy to overlook. 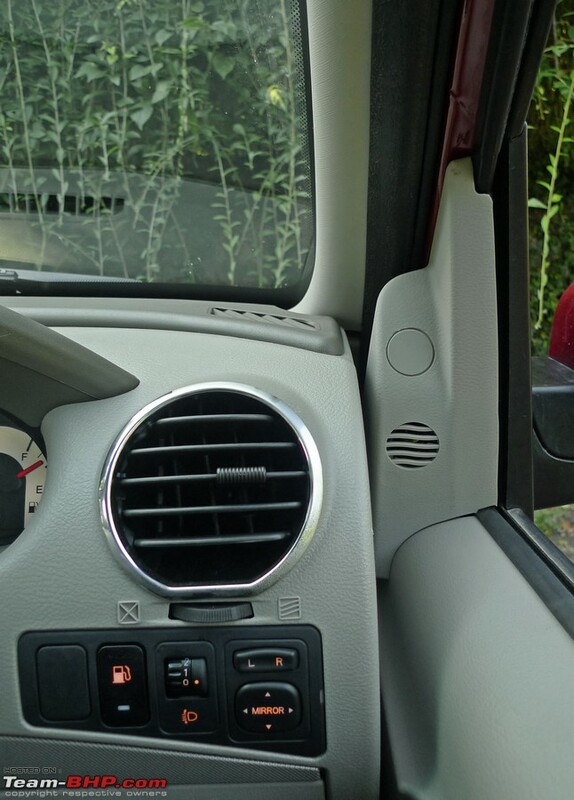 Even when the butterfly windows are unlocked but pushed in, they look like they are locked. •	Thanks to Parrys for accompanying me on this drive and his valuable observations. Thanks to Stratos for processing the pictures! Last edited by GTO : 8th October 2012 at 09:51. 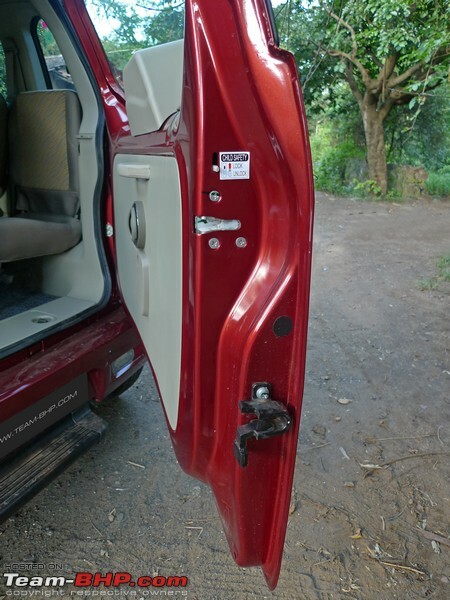 This tail-gate cap comes off to allow access to the rear door's hinge bolts (Thanks SS-Traveller!). Question is : why would any owner need to? Front seatbelts get height adjustment. Don’t miss the cheesy pink-coloured button and the gawdy lime green behind. 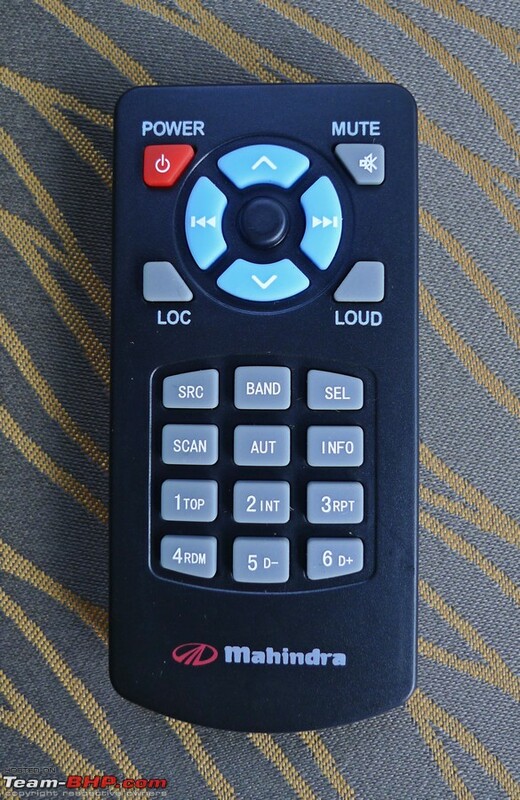 Who chooses the colours at Mahindra?!?! Last edited by GTO : 8th October 2012 at 12:58. Great review. My opinion is that the Quanto is great "beater" material. something to give to the driver to potter around the city. An excellent review as always GTO. Quanto could be an answer to the Renault Duster in terms of pricing and size. Hope M&M is able to get some share of that pie. Great review GTO as always. A few questions though. Considering the product development cost to be Rs.100 Crore , How much would it have costed to re-design the tall stance ? Unsorted dynamics seems to plague all Mahindra rising these days. Is the Lotus tie still live or is it dead or was it only for the specific project. Texture of materials used in interior. 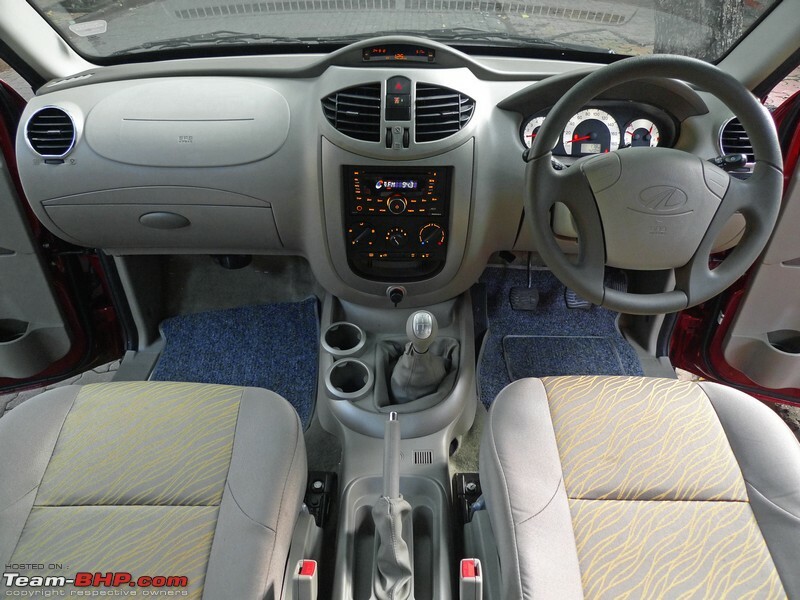 I feel Tata Storme's interior is much well put than the current Scorpio. Just wish they to up their game on reliability / pricing front like a Mahindra. One word. Fantastic. the review was crisp as usual and every + & -ves highlighted very effectively. Frankly I did not find the Quanto any attractive at all purely from the pics atleast , havent seen one in flesh. What about the handling? Hows the ride in the city and the highways? & Kitna deti hai? 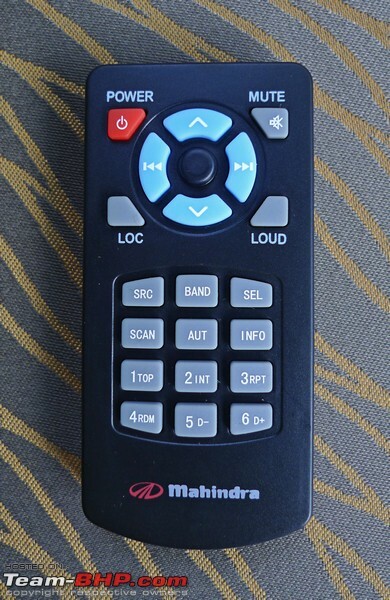 Is it me or does this offering from Mahindra seems like it has been done in a hurry? 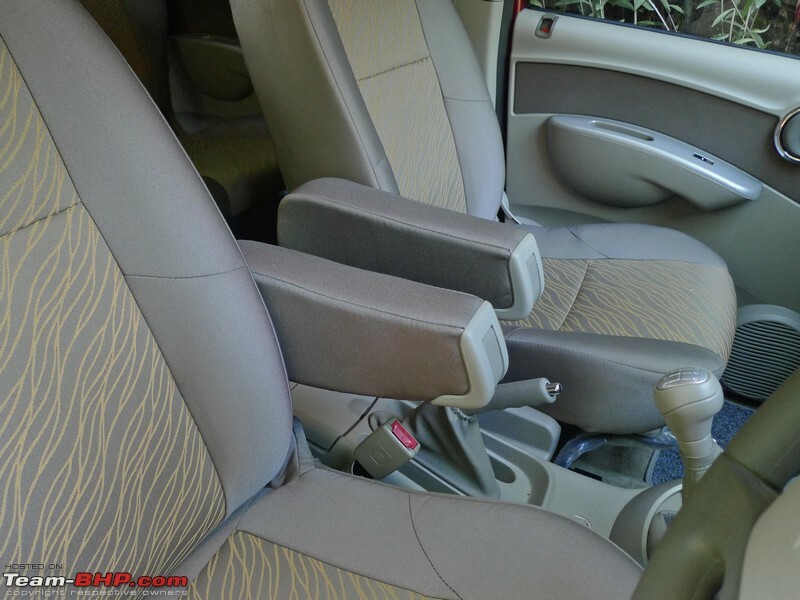 It does have competition, yes, but if Mahindra had taken some more time in design, fit and finish and ergonomics, the end product would have been much more better and would definitely have better appeal! BTW, what colors are offered on the Quanto? What a review, the attention to details is mind blowing. 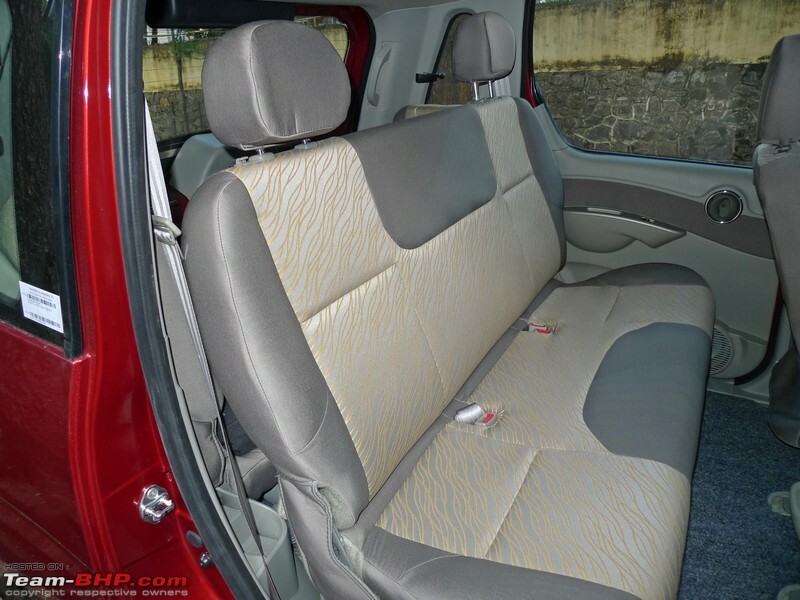 * Mahindra has completely covered the range with Quanto, Xylo, Bolero, Scorpio, and XUV5OO. 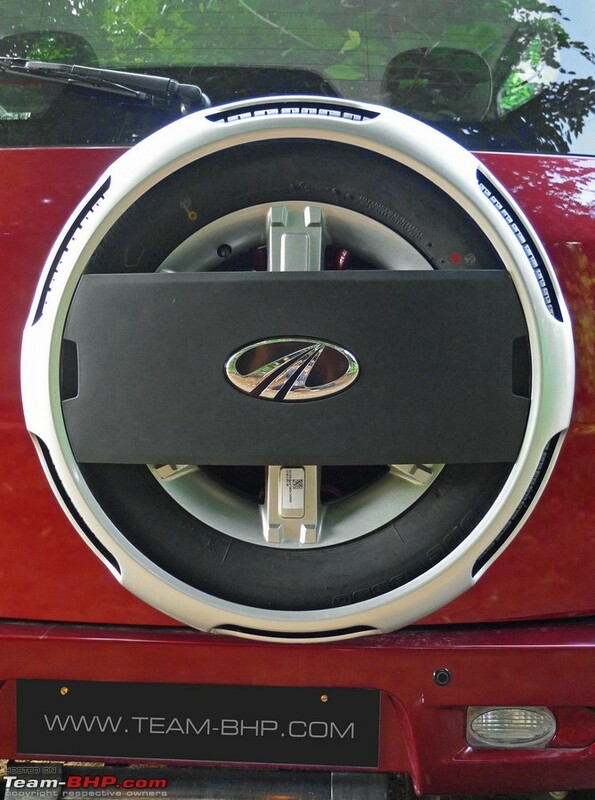 Sure, there is product overlapping, but ultimately Mahindra will smile its way to the bank. Tata has fallen way behind. * Quanto will be more popular in tier II and III cities where road quality might not be appropriate for hatches/sedans. * Verito seems to be the only burden on Mahindra's shoulders, its about time they do something (drastic) for it. * Just 145 kg difference between Quanto and XUV5OO!! * Most probably Xylo will take a beating as a smaller/cheaper "chhota Xylo" is available. 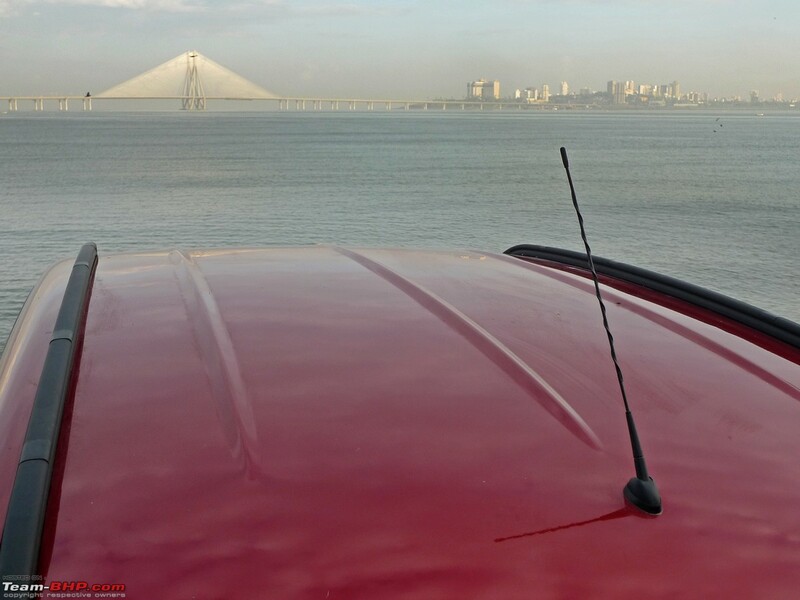 * Duster trumps Quanto in many aspects like looks (personal), GC, driving/handling dynamics. Mahindra sure could have made it look better in terms of the side profile. 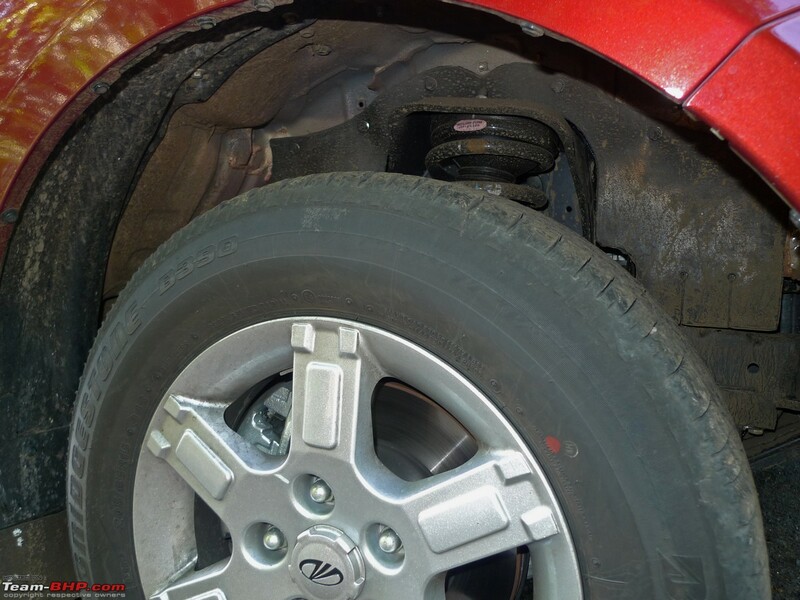 The spare wheel (when mounted - the last picture of Post #2) doesn't look completely parallel to the rear door to me. It looks very awkward. 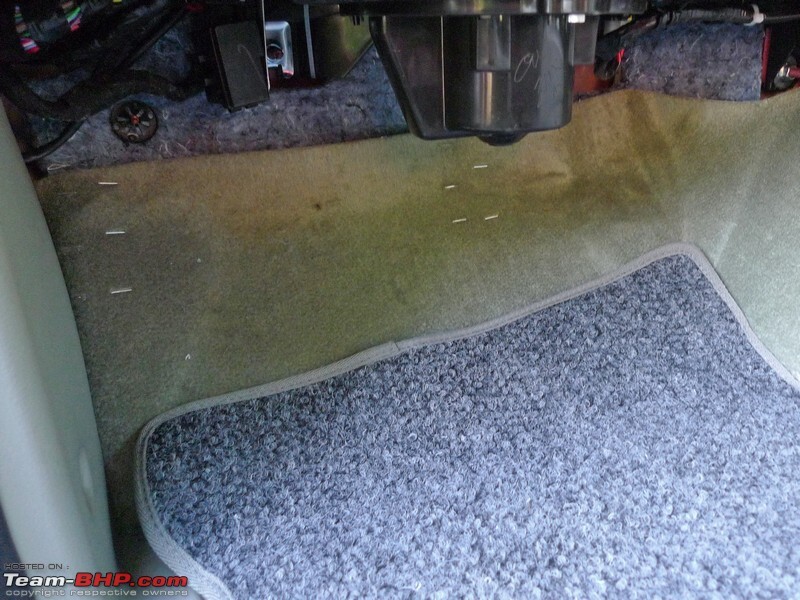 I can't imagine the Carpet is stapled!! Those door open levers (from the inside) look very flimsy to me. All in all, thanks for a great and much awaited review. It's always a pleasure reading GTO's reviews and this one is no different. Looks to be M&M seemed to be in a hurry in releasing the Quantro and is half baked. Could be a success in the taxi segment due to its price point. Would be interesting to see the future XYLO numbers as this tend to cannibalize them to some extent.